Khang and I fall in love more and more with Charlotte. Interestingly enough with every visit back to the Coast, we have a deeper and deeper appreciation for where we were raised and grew up. Maybe it comes with age or moving away. Either way, it’s the best of both worlds! 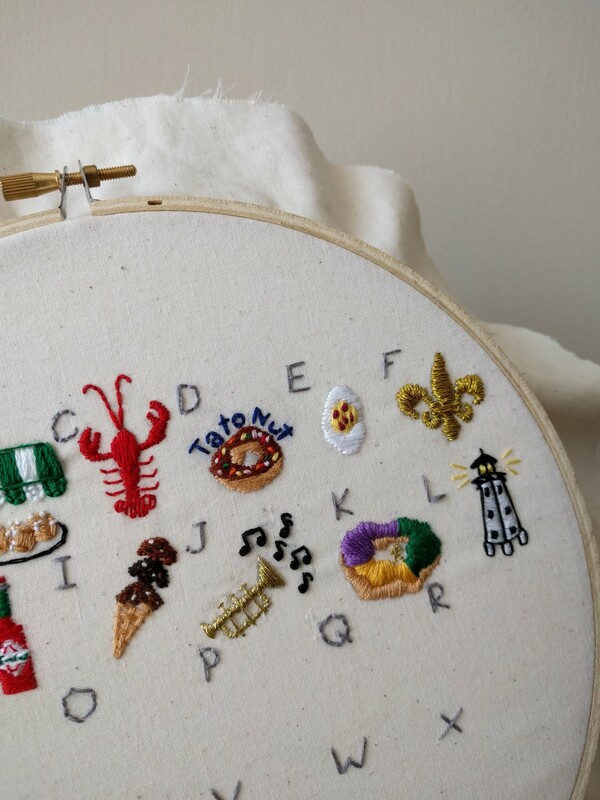 I’ve been trying to think of different ways to incorporate The Coast and that southern charm into our home. 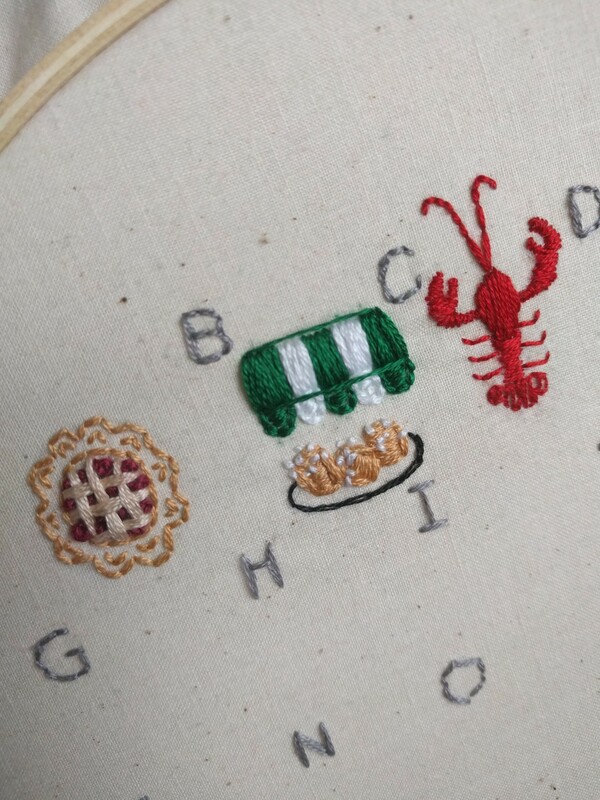 More specifically, things that give us the nostalgic feel of our hometowns of Ocean Springs and Biloxi. 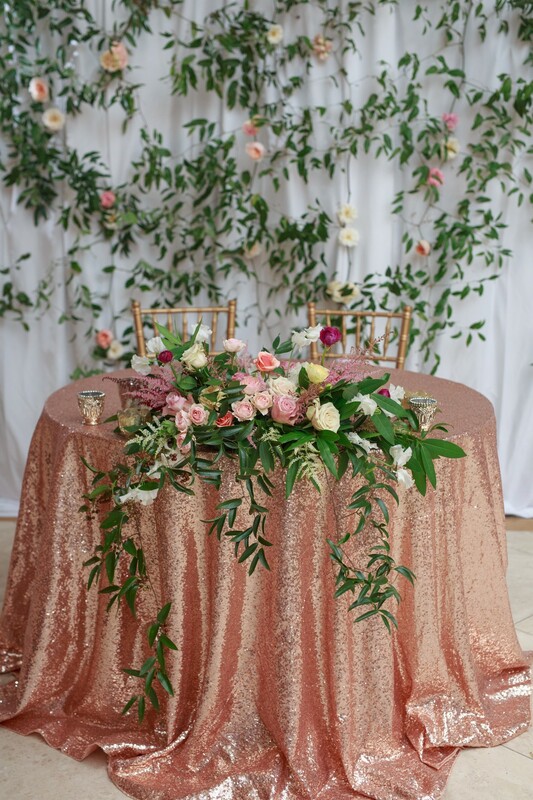 With a little inspiration on Instagram and countless Google image searches…this is what I ultimately came up with. 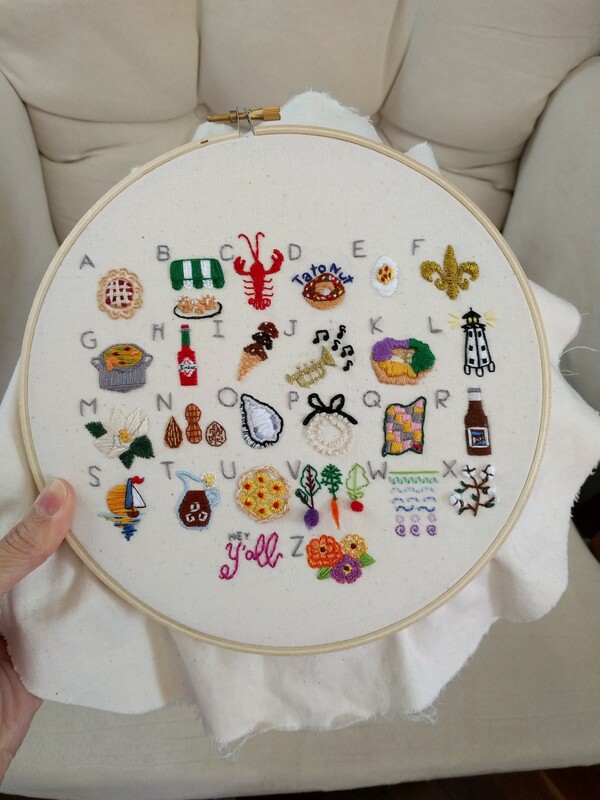 Each piece was stiched free-handed. No patterns. I’m pretty proud! 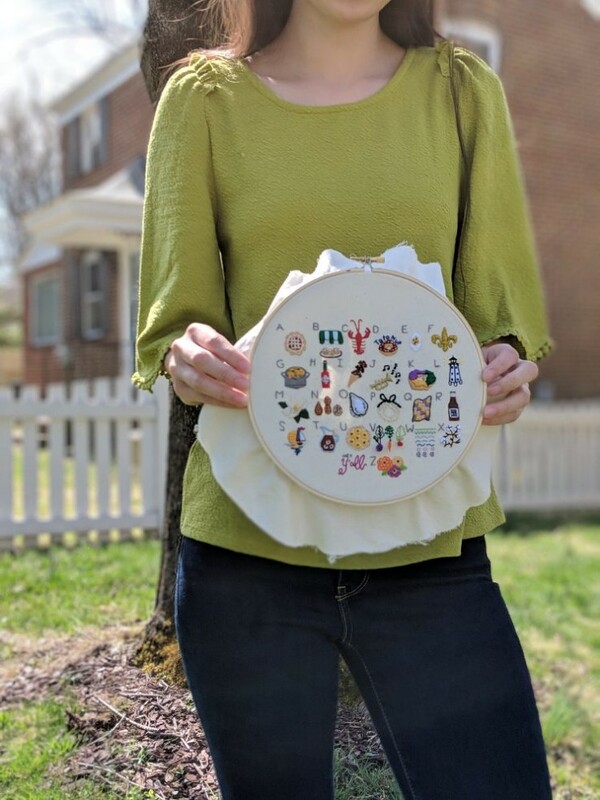 To say I’ve enjoyed working on this embroidery project would be a total understatement. I was happy to finish but a tad bit sad it’s over. 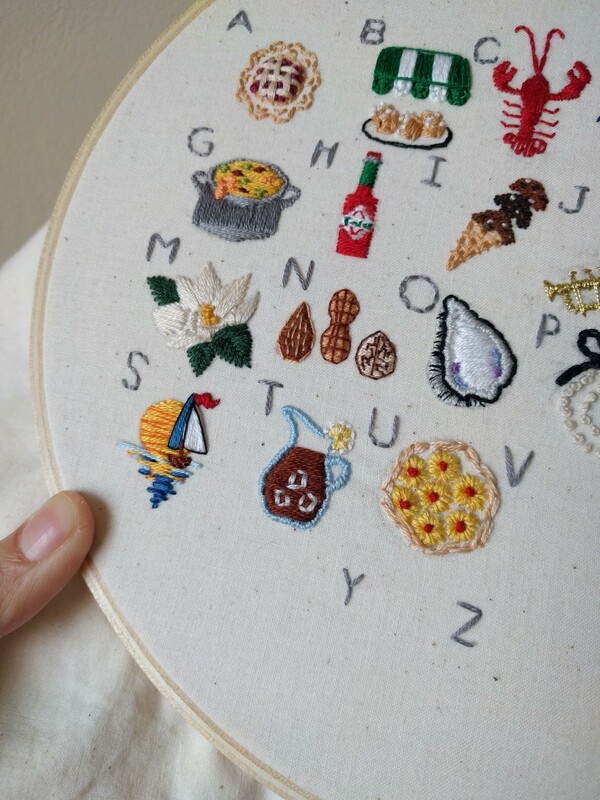 My favorite type of pie. But I’ll admit, I enjoy the crust more than the apples. Can you also picture the cloud of powdered sugar delight? And of course, the best beignets are made at Cafe Du Monde and enjoyed under their iconic green and white awning. I wasn’t happy with the awning and did it over…this would become a trend because I redid almost every piece at least once. By the only real donut shop, Tatonut, in my hometown of Ocean Springs, Mississippi. To me it’s an unofficial historic landmark. Try their blueberry cake donuts if you can ever get one before it sells out! To be specific, a deviled egg with a sprinkle of paprika. The official symbol for our Saints Football Team and honestly, all of New Orleans. Khang’s been cheering them on waaay before Brees. When Khang and I lived in Baton Rouge, there were gumbo tasting contests after 5K races. 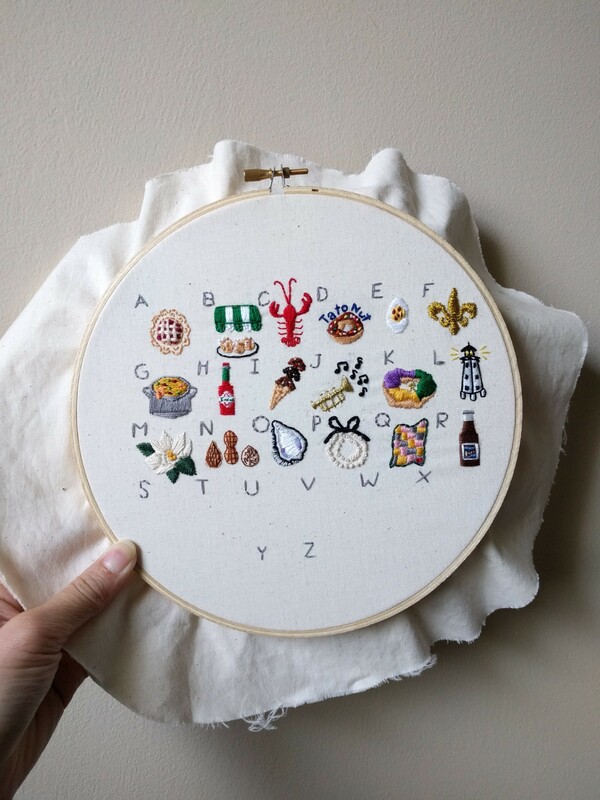 They take their gumbo seriously. 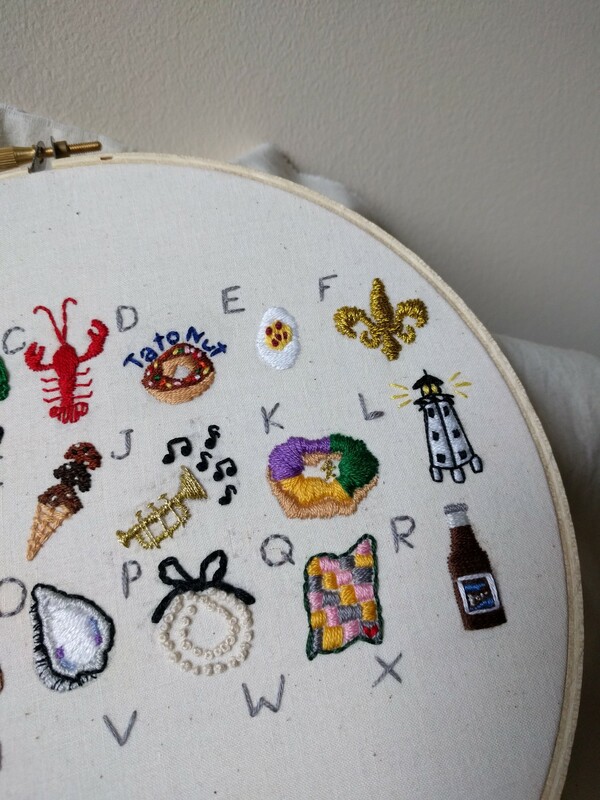 And my Mother-in-law makes the best gumbo! 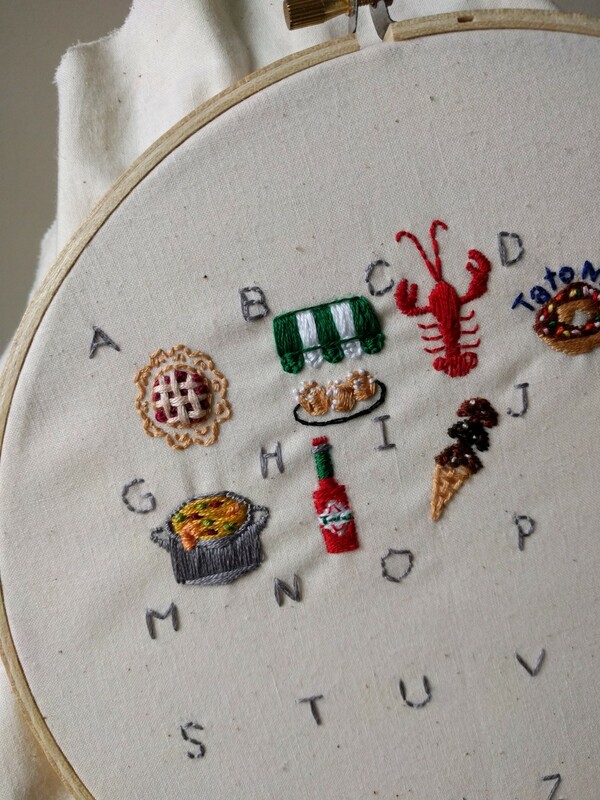 The most famous brand back on the Coast would have to be Tabasco. 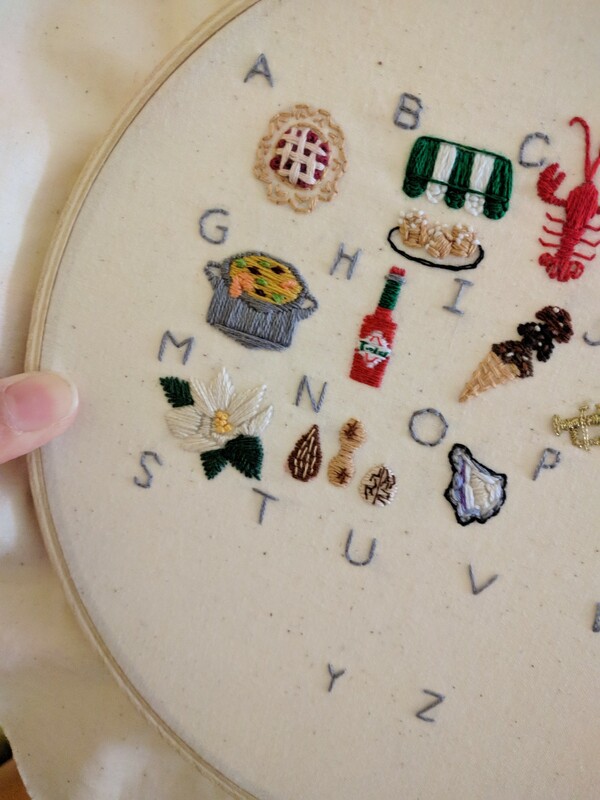 Notice the tiny “T”? It’s still produced on Avery Island in Louisiana. The flavor is Mississippi Mud Pie. Oh, I lie, that’s technically my favorite kind of “pie”. This teeny tiny trumpet is in my top three favorite. I mean I love them all, but this one is at the top. Might be because I redid it around SEVEN times! I imagine hearing the slow blues music in my head. Mmmmhmmm. It MUST be decorated with green, purple, and yellow frosting with a plastic baby secretly tucked inside. If honestly doesn’t taste as good if not. This is when I became deeply attached to this project. Not just any lighthouse, but the Gulfport Lighthouse, where Khang asked me to be his wife on the cutest sailboat during sunset in the bay a few days after our 8-year anniversary. The Mississippi State Flower and Tree! 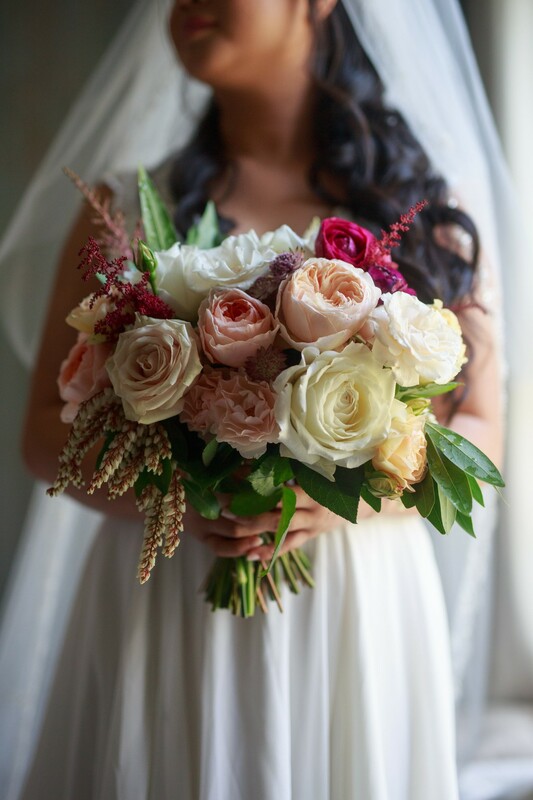 And in my opinion, the most elegant of flowers. When they bloom, I know instantly before actually seeing them due to their distinct scent. I am not a fan of nuts. But that does not stop Southerners from using them in so many dishes. Raw, chargrilled, rockefeller…it’s all good! I prefer them raw on a saltine crackers with lemon squeezed on top and a dab of Tabasco. I’ve always had a love for pearls. My promise ring from Khang is actually a pearl. I think every girl should own a nice piece of pearl jewelry. My super talented sister, Ginni, made me a beautiful crochet quilt about 6 years ago. The colors I used are based on it! I don’t drink soda now, but when I was younger, Barq’s Root Beer was my favorite and originated in Biloxi! Every now and then, I crave a root beer float! Y’all, basically our proposal story. And it’s Khang’s personal favorite! Sweet iced tea of course! As one of my favorite people, Ms. Debbie, advised that it’s best made in an iron skillet. 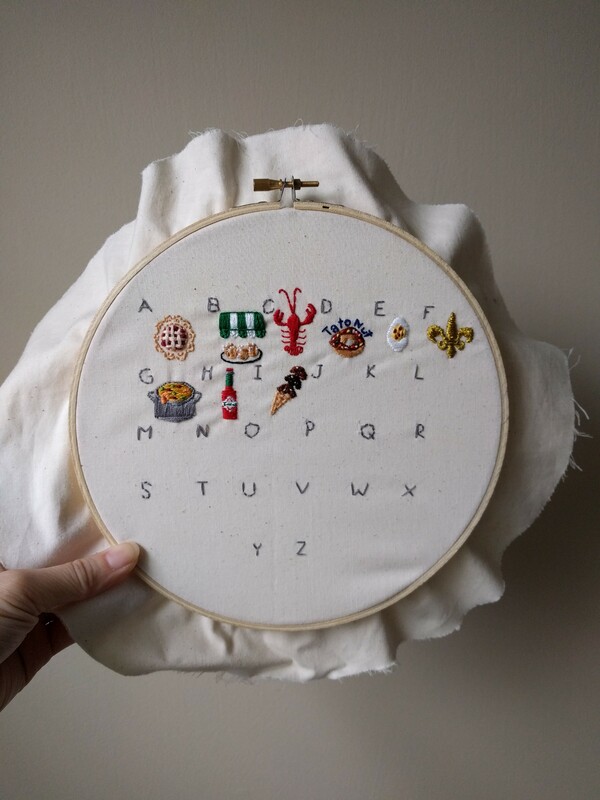 It’s easier to make than stitch! 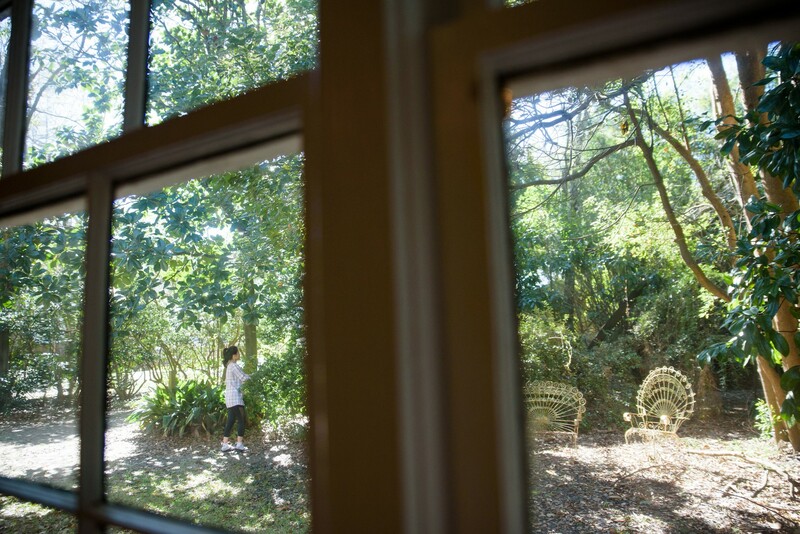 If you grew up in the South, you either have your own garden or know someone who does. Aren’t they just darling?! The felt turned out better than expected. Walter Anderson and the Anderson Family had (and still) a significant influence on Ocean Springs. I went back and forth on how to represent him. I remember learning about the 7 motifs he repeatedly used in his paintings and ceramics during my visit to The Walter Anderson Museum(WAMA): straight line, zig-zag line, wavy line, half-circle, 2 half-circle, circle, and spiral. I chose those specific colors to imitate his watercolor paintings. It’s actually an adjective. The definition is “of, like pertaining to cotton”. The word “cotton” was all I needed. I automatically thought of the cotton flower fields during my drives back and forth from Ole Miss to Starkville to visit Khang. Um, yeah. Y’all know why! (Shout-out to my fellow Ocean Springsian? ?, Christine, for this great idea), which are native to the area and come in such colorful varieties. 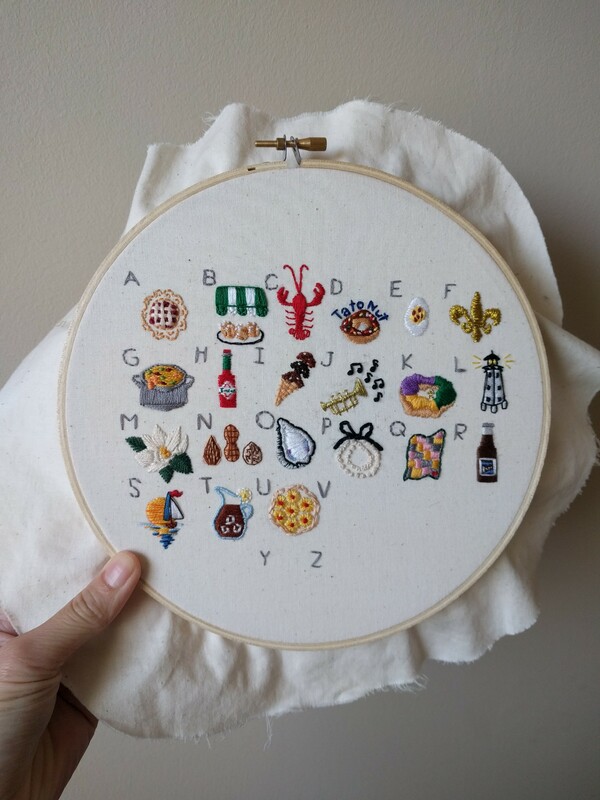 This little project has made its way close to my heart and I get so excited when I think about passing it down to my children and grandchildren. A Phamily Heirloom for many generations to come. 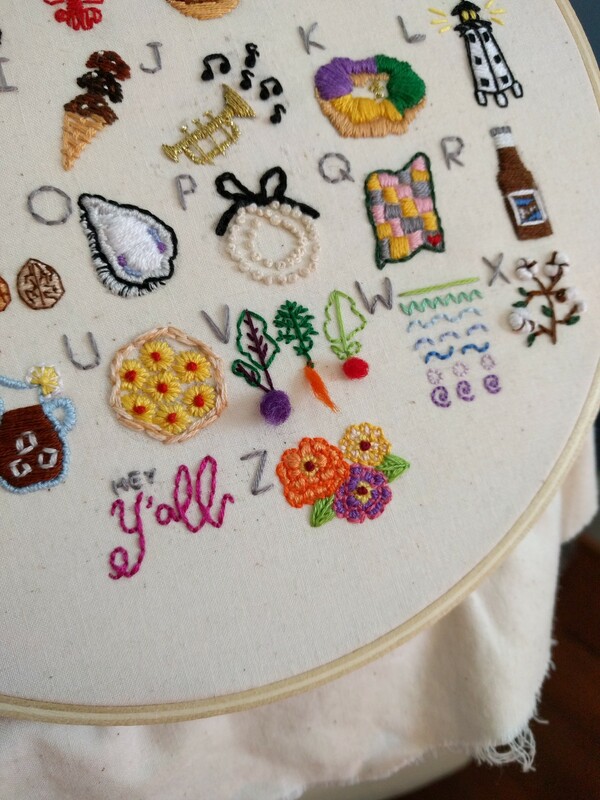 Thank you thank youuu to all of those who gave suggestions and encouraged me along the way! 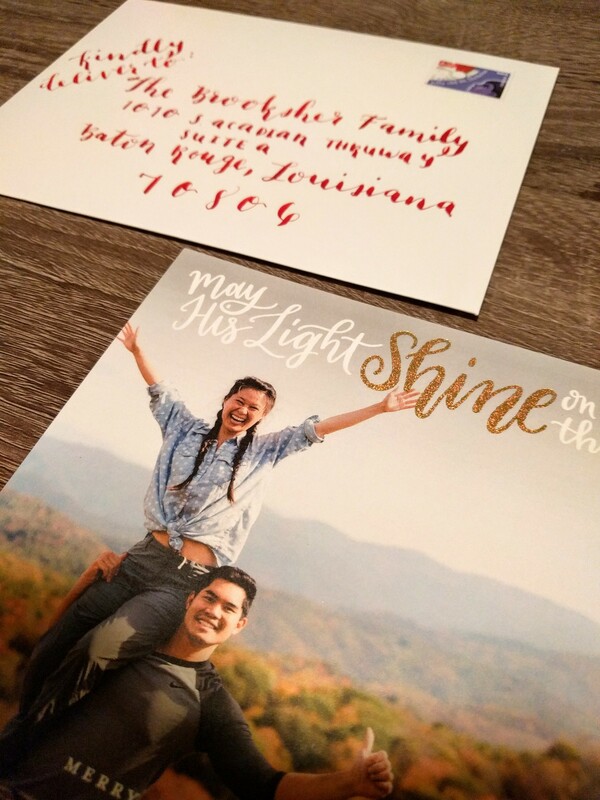 Our very first official Christmas card! Yay!! Last year, we didn’t bother. And I almost didn’t this year, but we got a cute shot during our Asheville camping trip earlier this fall that worked out perfectly! I think it represents us well. Hah! 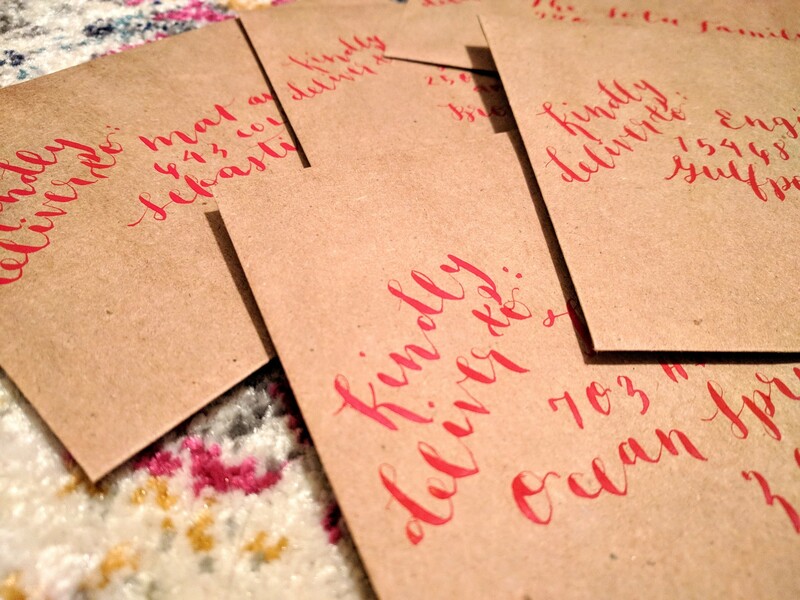 I hand addressed all the envelopes and, of course, I was reminded of how much I love love calligraphy. Disclaimer: Not our real address. It’s especially fun because I get to customize everything like the colors and greetings! 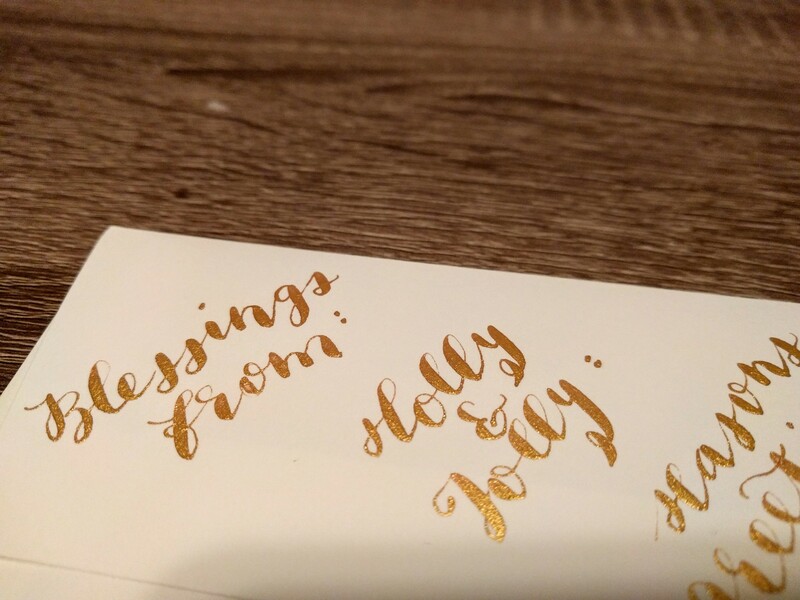 After much debate (with myself), I decided on “Blessings from” and “Kindly Deliver to” with a tilt. There’s something about someone’s personal handwriting on paper that makes a letter or card so much more special. This is probably why I’ve kept every single card and poem Khang has ever written me! Makes me sad that some schools don’t even teach writing or cursive anymore. I vow to teach my children this lost art. 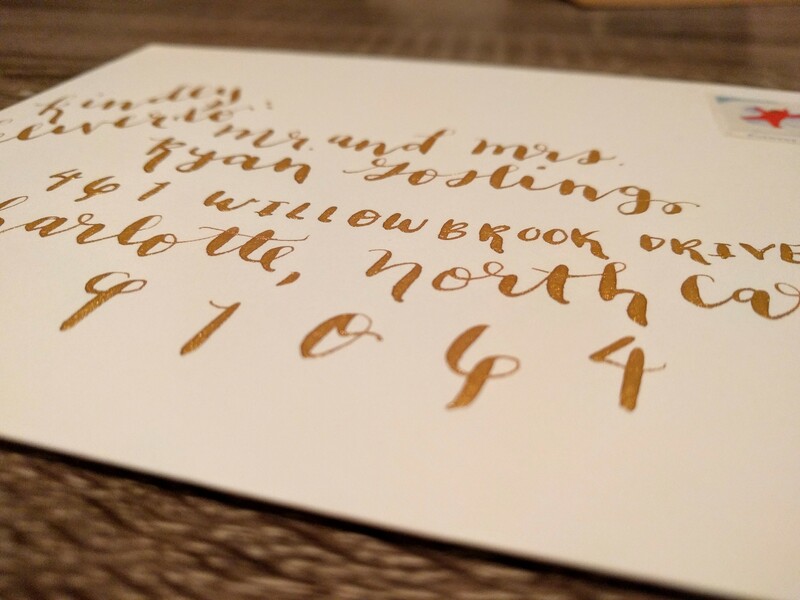 So this is my attempt to try to inspire as many people out there to try calligraphy! If you’re skeptical or doubting yourself–DON’T! 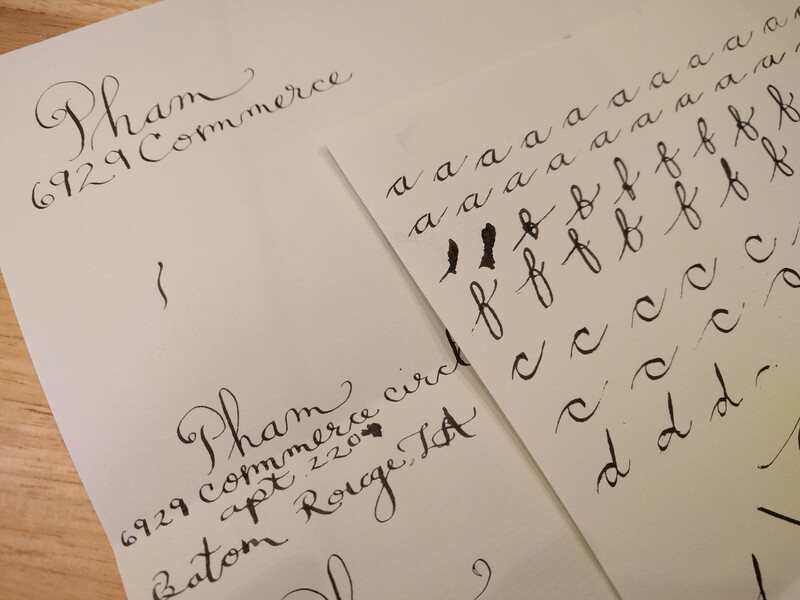 Here are two practice sheets from my very first attempt back in ’14. It was rough, y’all. I waited two weeks until I tried again because I was so discouraged! I did a comparison from that first time to present day. Look at the difference! 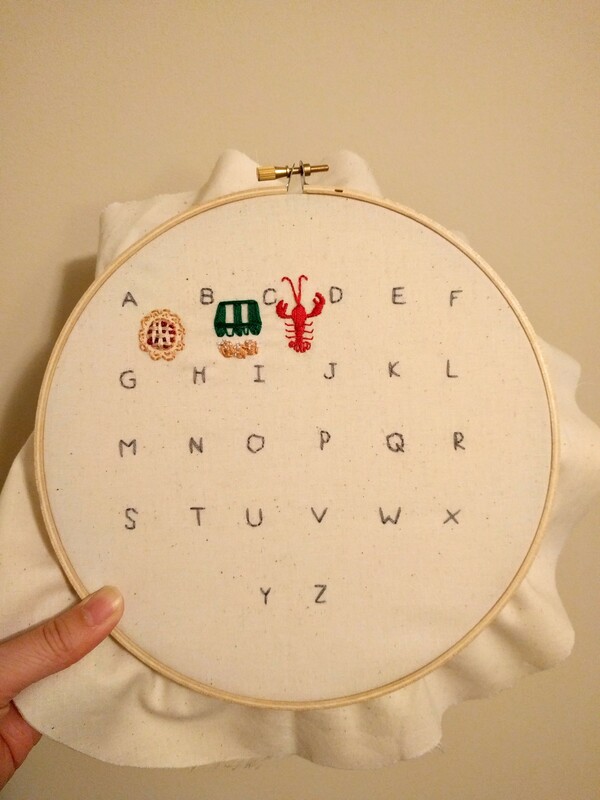 I remember hating the letter “B”, now I love it! 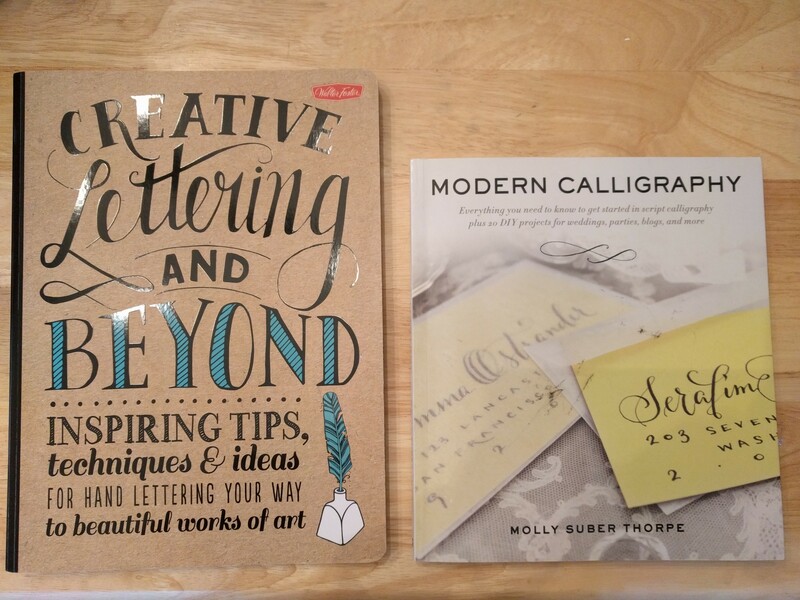 This book (I started with this one and its great for other handlettering techniques like chalk or paint) or this book (great for just calligraphy and provides different options for each letter). 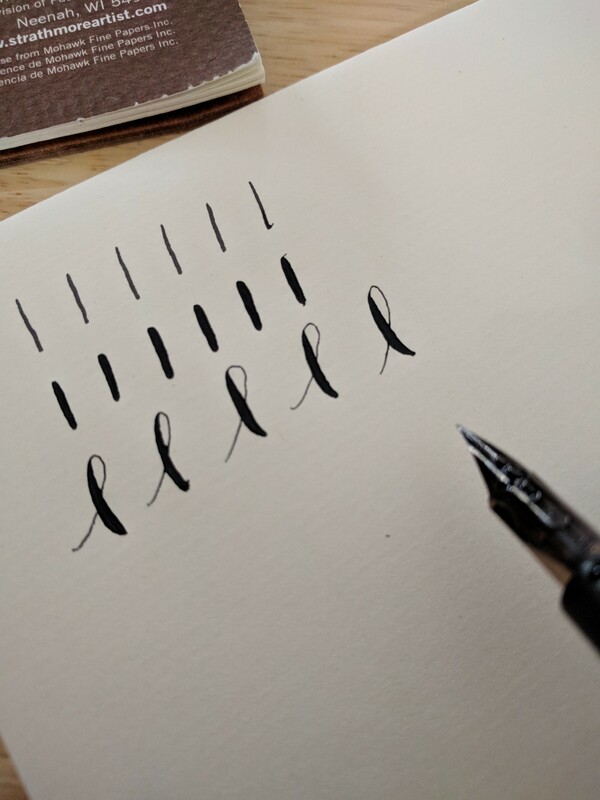 Modern Calligraphy set at Micheal’s- Recently saw this set and it has my Top Three Favorite nibs! And it comes with a little ink too. 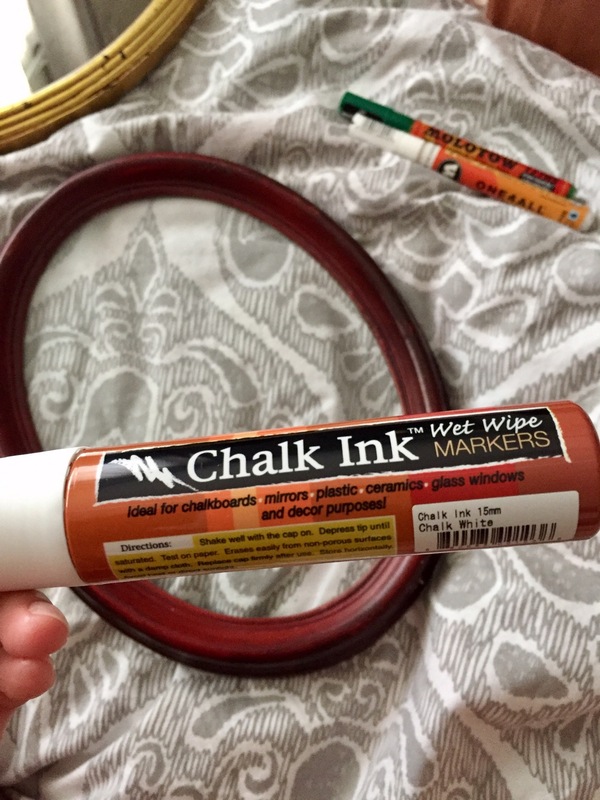 Calligraphy paper– Can be bought at Hobby Lobby too! You cannot use normal notebook paper because the ink will bleed. That’s it! I am very practical especially when it comes to my wallet or starting a new hobby. As you get more comfortable and confident then you can explore different pen handles, nibs, and even colors! Over the past two years, I’ve learned a few things that have helped me. Of course, I’m no professional and everyone is different. Do what works for you, always! If your nib is brand spanking new, then it’ll have the factory-applied lacquer (prevents rust) coating on it. It’ll need to be removed before usage. Use warm water, soap detergent, and an old soft toothbrush. It will help with better ink flow. I like to run my nibs through a flame for 1-2 seconds just to make sure that waxy coating in gone but you don’t need to do that if you already wash and rinse the nib as stated above. 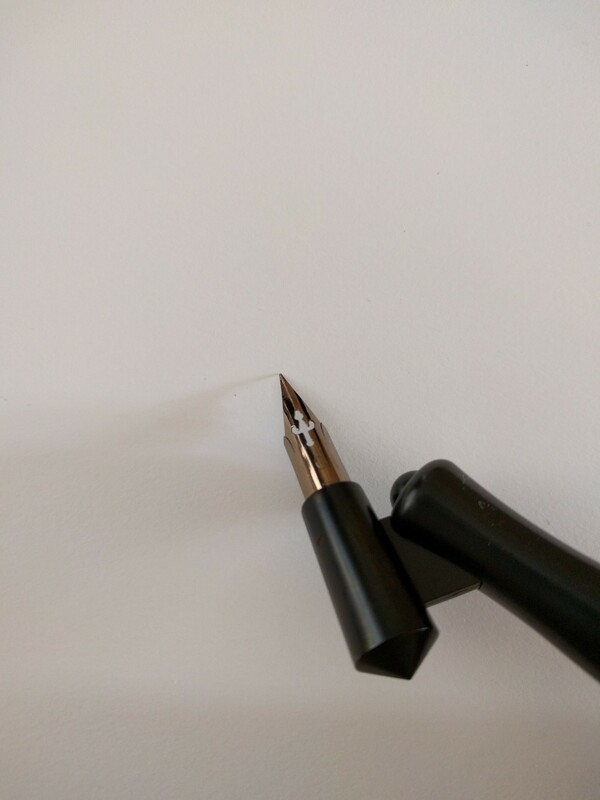 Always always dry your nib after cleaning–it will rust! Do not death-grip your handle. 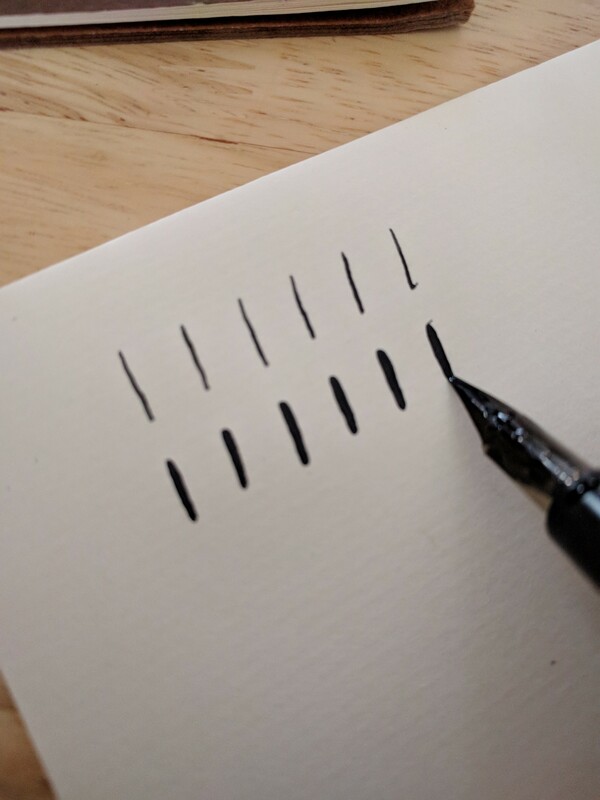 It takes very little pressure for the ink to flow and it’ll help with smoother transitions with all the curves and loops. 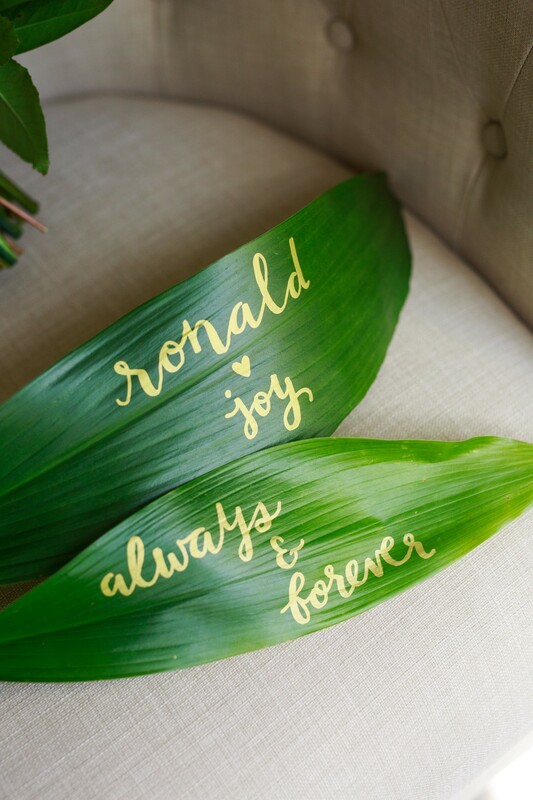 Don’t get too caught up on making your calligraphy look like someone else’s. 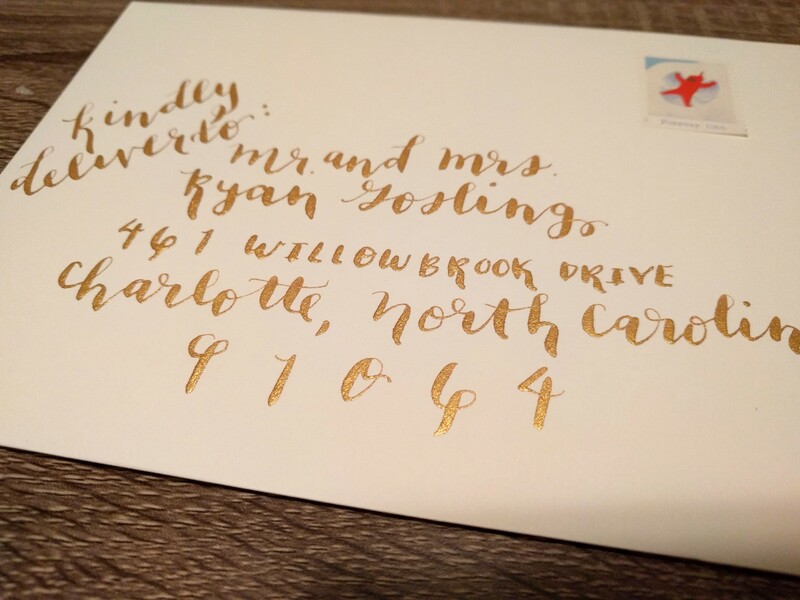 Everyone’s hand-writing is different so your calligraphy will be different too, which is a beautiful and unique thing! Don’t forget to take breaks or your fingers will cramp up and you’ll just get frustrated and waste your precious (& expensive) ink and paper. 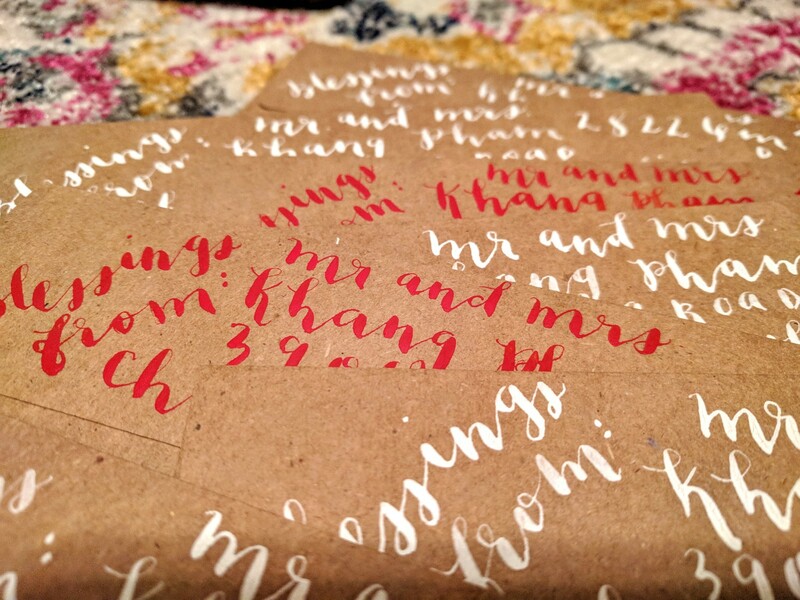 Once you use up all the space on one side of your calligraphy paper, wait for it to dry, and use the other side too for practice. Practice, practice, practice! It will not look pretty or the way you want it to at first but it will get better. 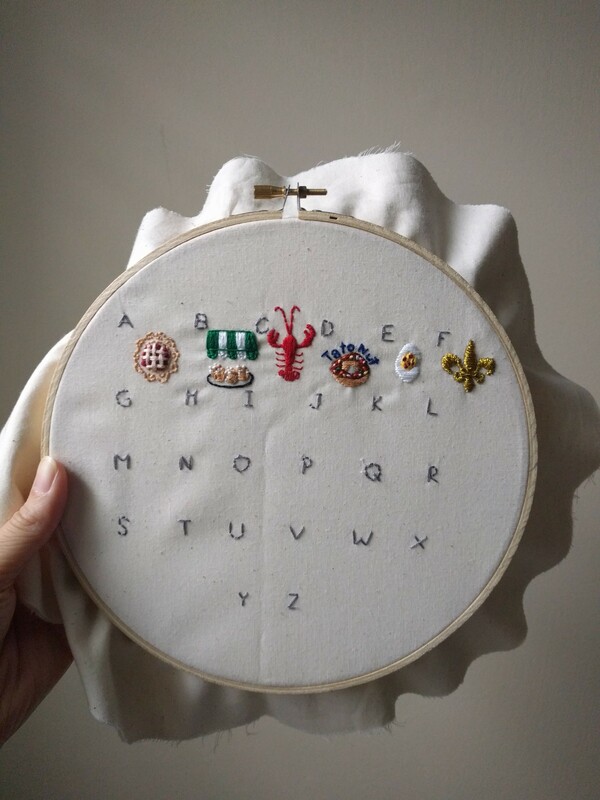 I’m still learning after 2 years! 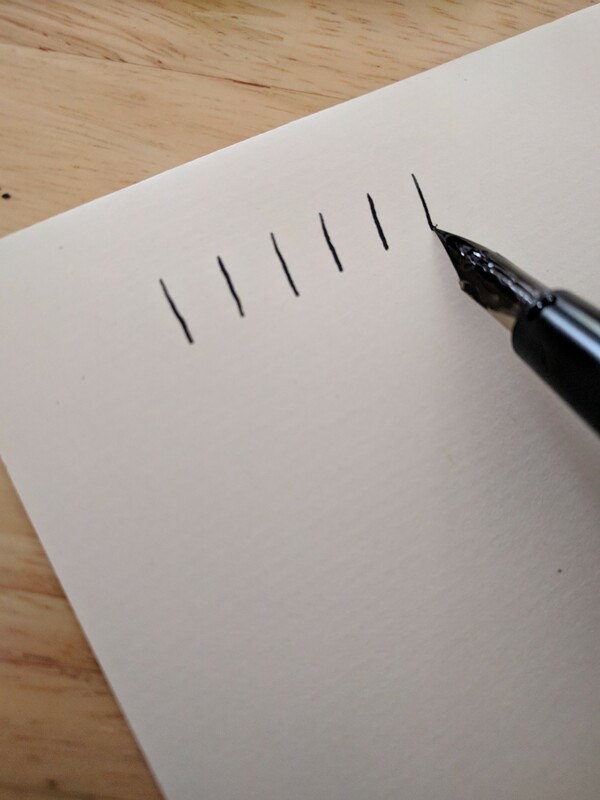 Just remember: Anytime you are making a “downward stroke” then the line will be thicker because you will be applying more pressure, which causes the “split” on the nib (tip of pen) to widen. 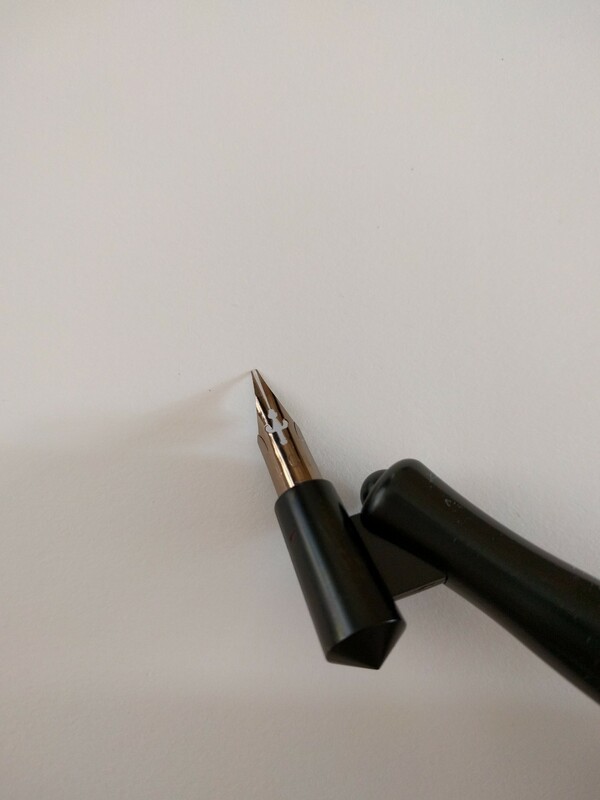 Notice the space on the nib. See how it’s wider? This will create thicker lines. And then “put it together”. Just giving you a small idea of what you expect. The book(s) will be very helpful. If you like videos, then there are video tutorials too on Youtube! I’m more of a reader. Please feel free to ask me any questions! Or if you need clarification. 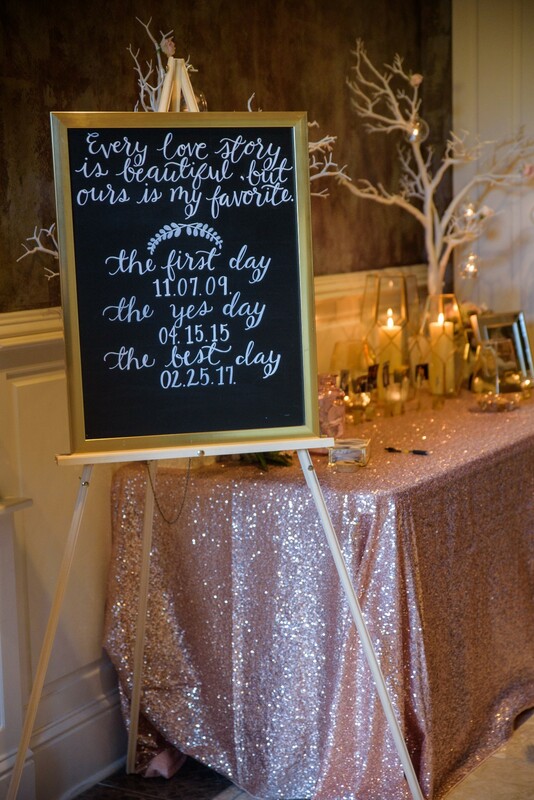 I will try my best to answer questions or help in anyway so that your “Calligraphy Dreams” come true! I promise it’ll be worth it in the end. 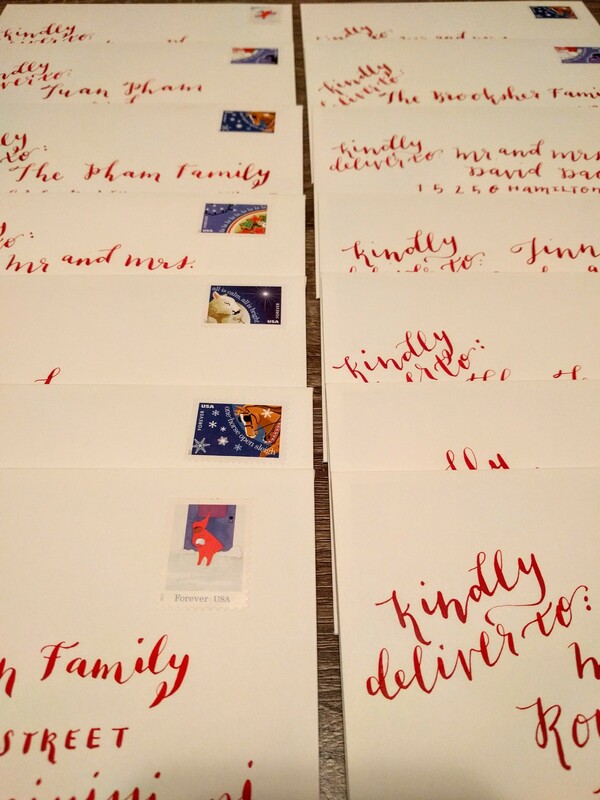 I almost didn’t want to mail out our Christmas cards because they were so beautiful! I really don’t know how I ever survived childhood. So much has changed, but we’re still a big hot mess. And I know I wouldn’t be the person I am today without them. They’re individually so different in their own right. And I love each one so much. Today, it’s all about my our baby sister, Joy. We used to “hate” one another … like big sisters versus little sisters do. Just ask our group of girlfriends growing up. She’s exactly 1 year and 11 days younger than me. We were forced to share everything with much resentment. This only added to our annoyance for the other. And now thinking back on it, I never ever ever thought in a million years that I would be sad to share her. Like what? How did that happen? Y’all, my baby sister is a married woman now. 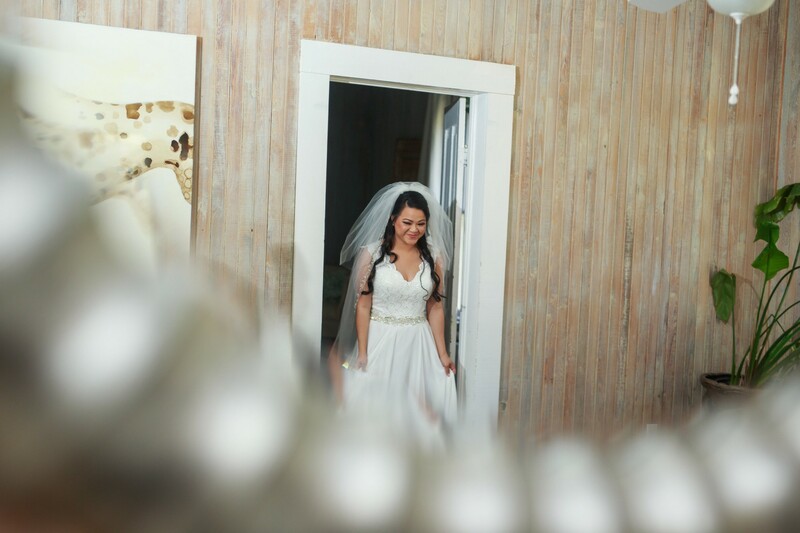 Witnessing her during this whole marriage process was more emotional than I ever thought possible. Listening to her talk about her soon-to-be husband with so much love, care, and utmost consideration was a prideful experience for me. For me, the best thing about being a big sister is watching your little sister grow up in all ways possible. 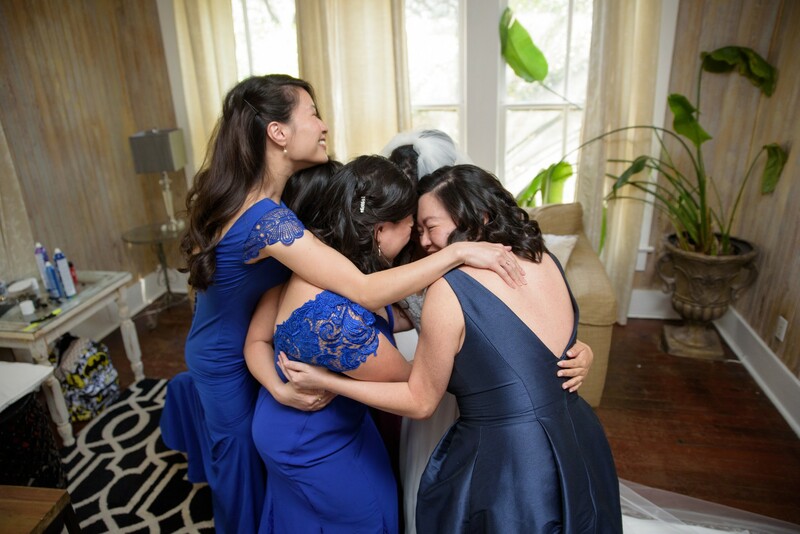 Joy likes to say “Sisters by birth, but best friends by choice” and I couldn’t agree with her more. I’m so proud to be her big sister. My family likes to joke that she got lucky with Ronald, but I know the truth. And it’s the truth that Ronald married a sweet and caring soul who puts those she loves at the top of her priority list. I know Ronald is at the very top and just know they’re in for a lifetime of happiness. 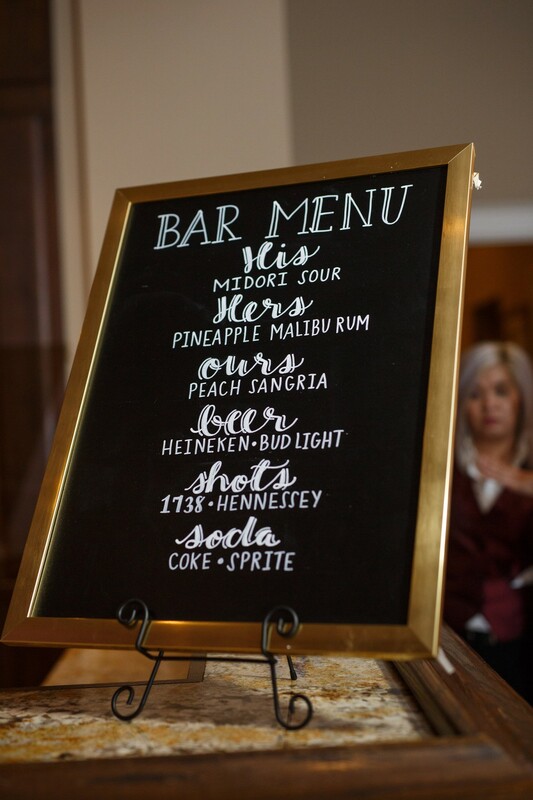 So Joy asked me to handletter a few signs for the reception. They turned out a lot better than expected. 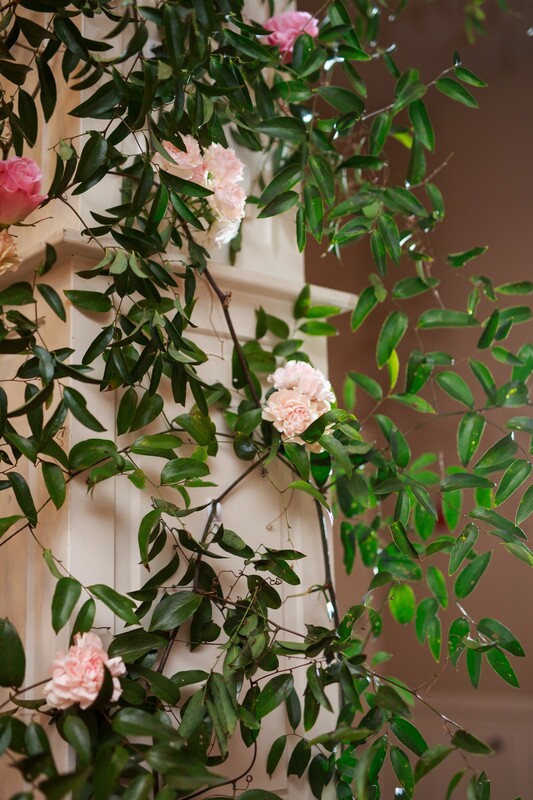 Their florists from The Petaler Co did such a beautiful job executing Joy’s vision by incorporating natural arrangements of florals and greenery at the reception hall. 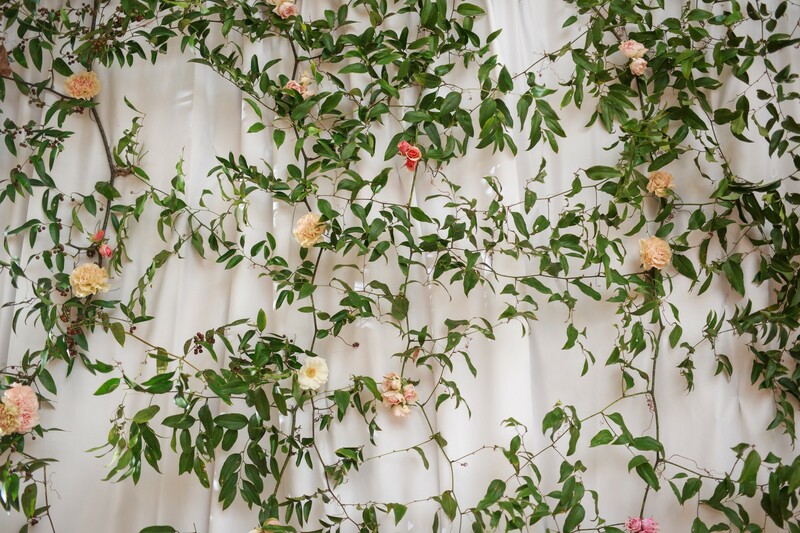 Look at that gorgeous flower wall! …it can be confusing for the two of them on certain responsibilities they each have. 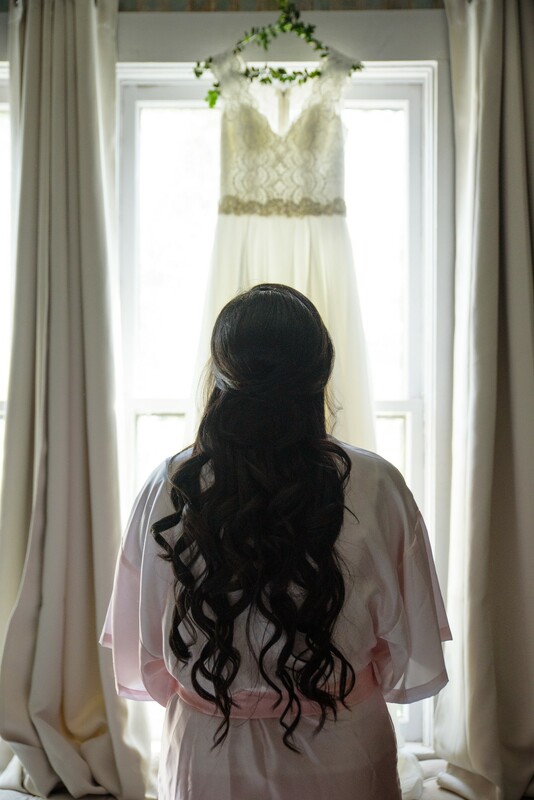 Example Numero Uno: Bridal hangers. 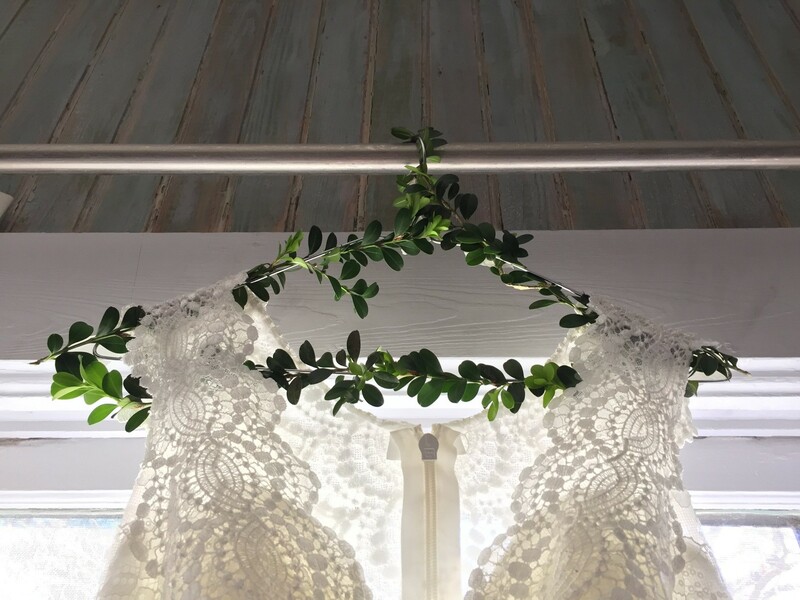 Jill and I both thought the other would take it upon herself to make Joy a bridal hanger. But I was not going to just call it an “honest mistake” and continue putting on my makeup. 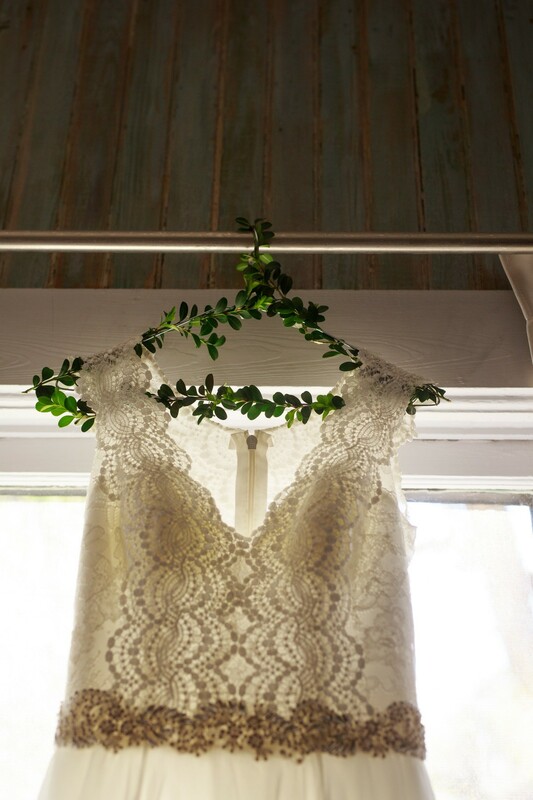 I quickly rushed around the cottage rental in search for prettier hangers or pretty ribbon. 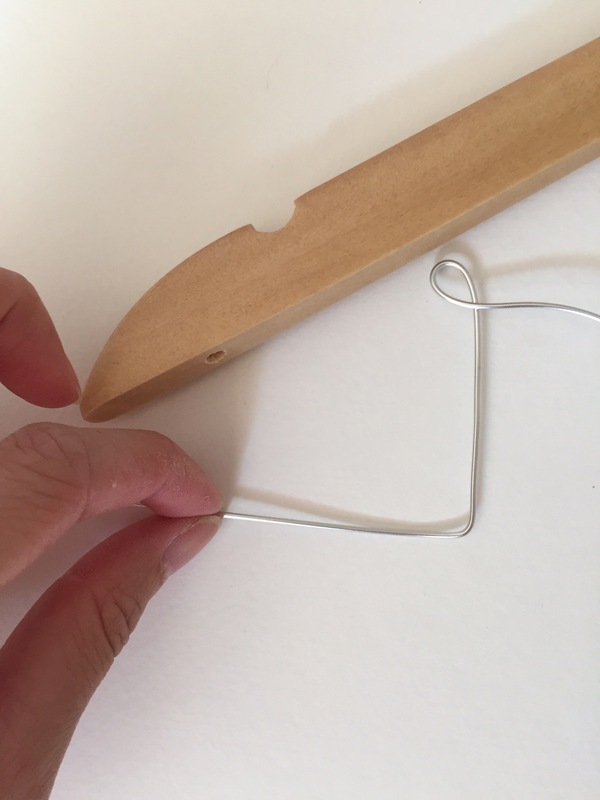 I remember holding a plain metal hanger we happened to find laying around. 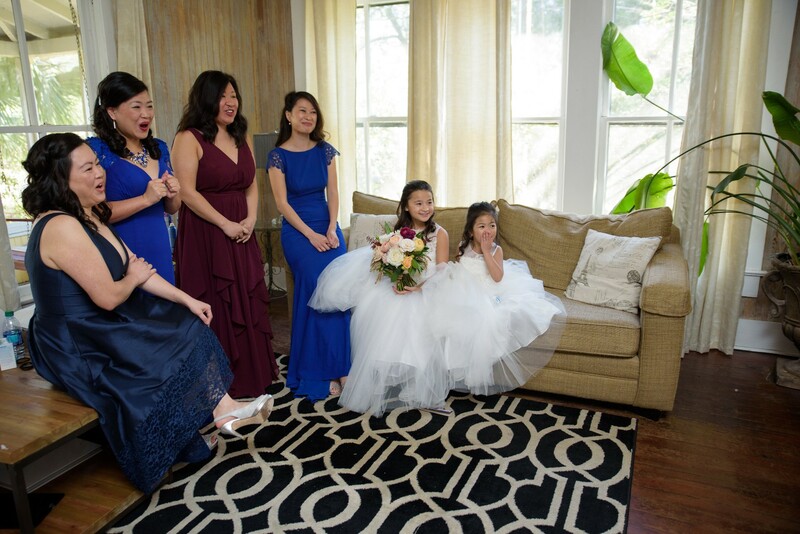 And then looking at Joy’s beautiful bouquet…also remembering the gorgeous flower wall being set up from the day before. I hastily told the photographers to give me 15 minutes and bolted out the door. Yep, that’s me collecting leaves to embellish the metal hanger. 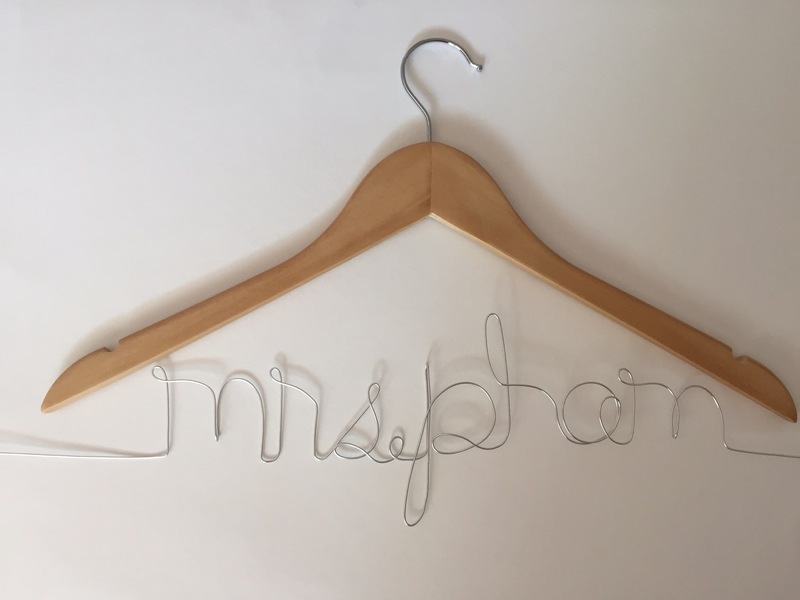 I was determined to give my baby sister a one-of-a-kind bridal hanger. I saw some palm leaves and remembered my paint pens I packed in my makeup bag for “just in case”. I live for opportunities like this. 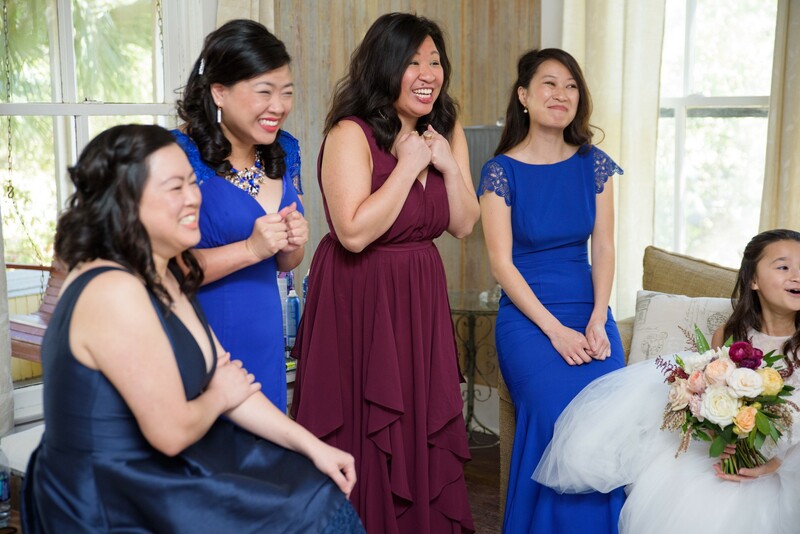 WithJules made me confident enough that day to pull off these lovely details (on short notice). 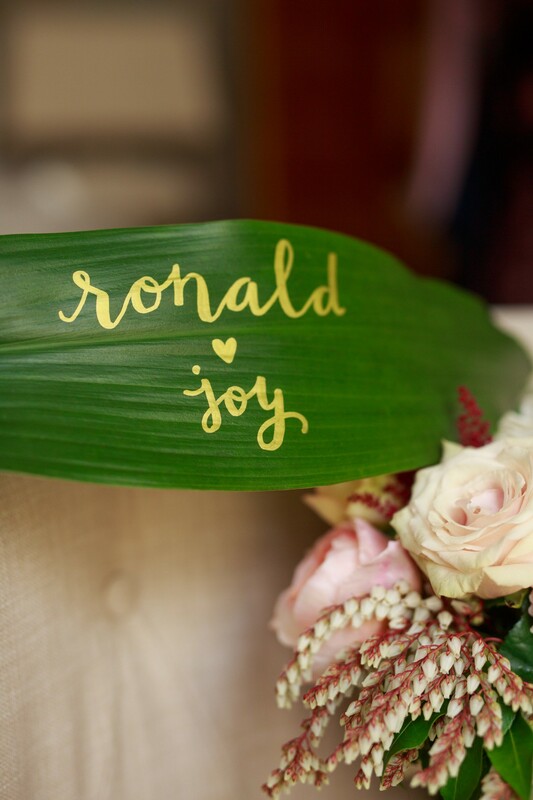 Thank you both Joy and Ronald for letting me be part of your beautiful day! I’ll end this post with my sweet family. 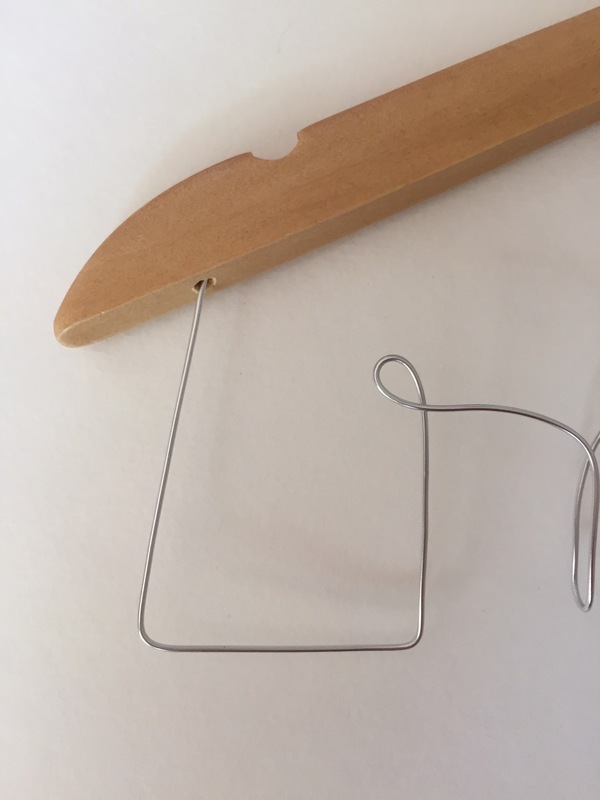 So the other day a friend asked if I still made “wire name hangers”. 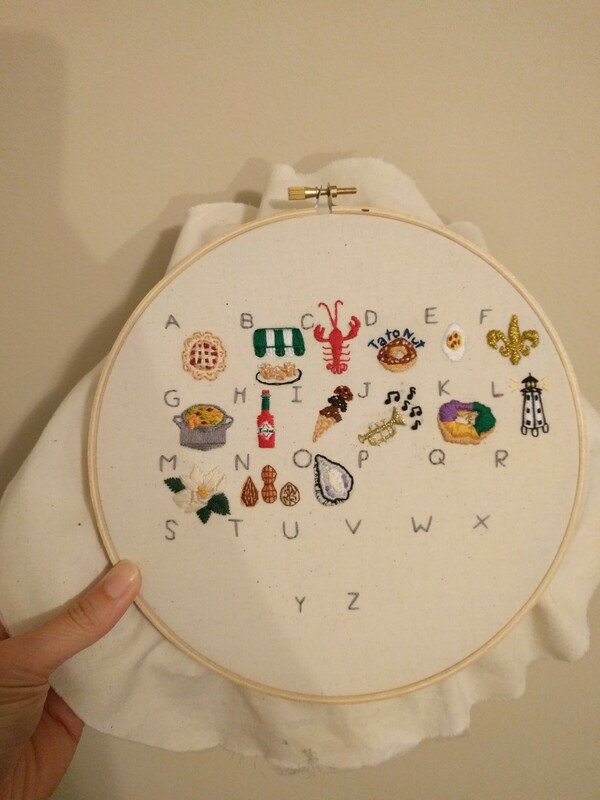 Recap: I made one for my engaged classmate who was my Secret Santa. She loved it! Soon after a group of my classmates and professors were planning a Dental Hygiene Mission Trip to Belize. 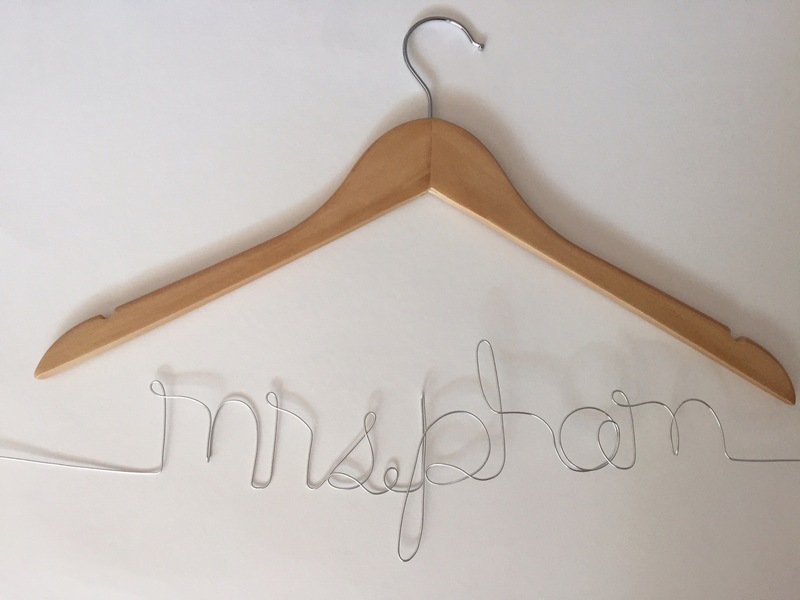 I wanted to go so badly I and came up with the idea to raise funds by selling my “bridal hangers”. I only had about 2 weeks to raise over $1,500. Unfortunately, I only raise $500 but donated all of it to their mission trip. The money was used to pay for the extra amount of luggage filled with toothbrushes, toothpaste, floss, fluoride, and more for the Belizean children. Khang and I made that trip with my classmates and professors a year later and it’s still one of the most rewarding and life-changing times of our lives. Back to my friend. Long story short-I was more than happy to do them for her. 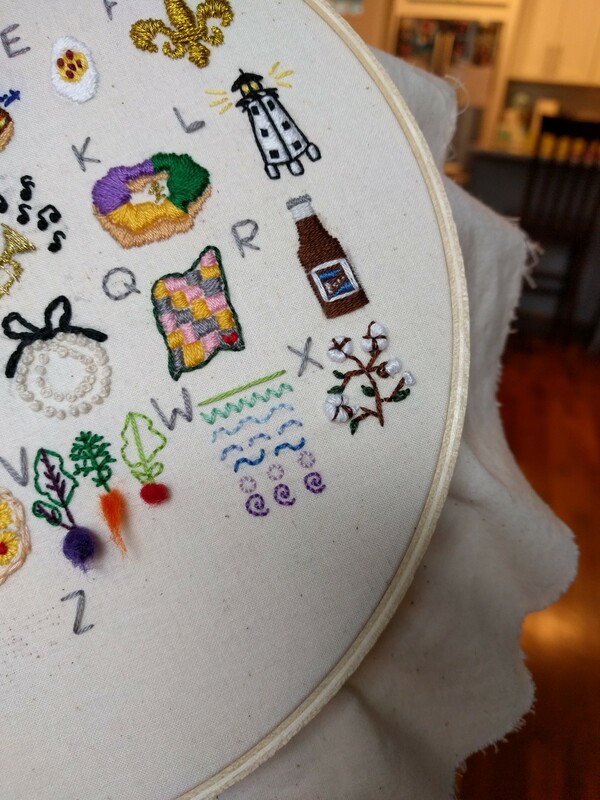 I get randomly asked about them every now and then, so I figured other people would find it useful if I did a tutorial. They’re best for bridal parties, but I’ve made one for someone to hang their white coat on after getting her Doctorate Degree. The possibilities are endless! 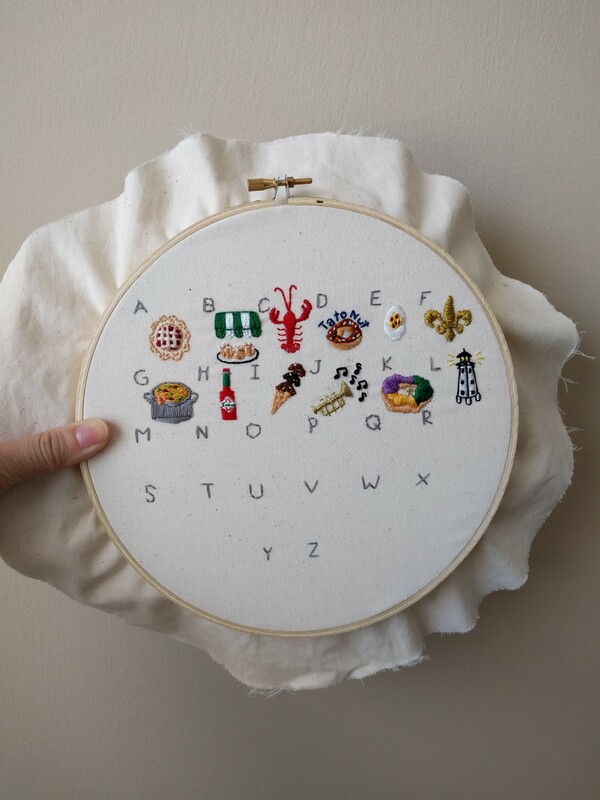 So this isn’t going to be a step-by-step DIY because they’re are so many names. But I’ll give y’all advice to make it easier for those trying it for the first time. Warning: You will most likely not get it right on your first try, but it’s okay! The supplies are cheap or at least the kind I use. 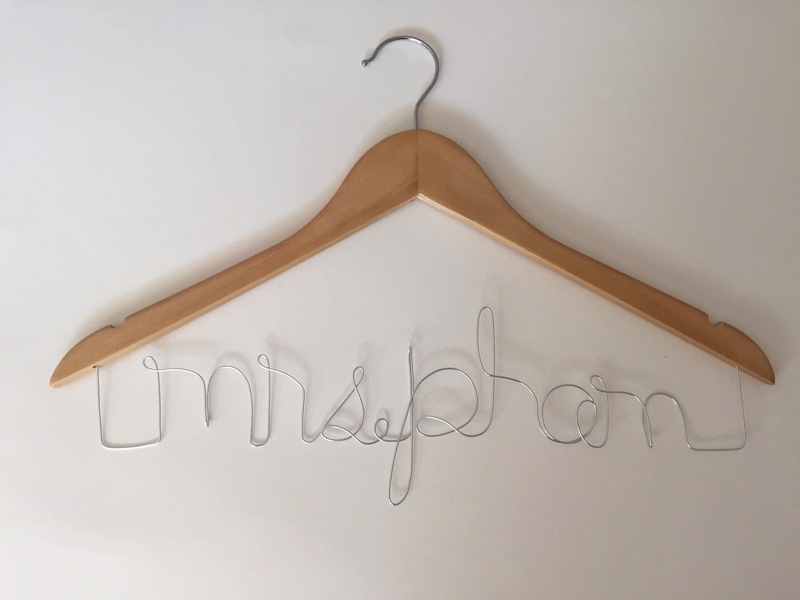 Hanger- I get mine from Marshall’s or TJMax. Be sure to get the kind for straps to hang. Also make sure it’s completely wood. Wire- I like to use aluminum wire like the brand On A Wire. The 16-gauge is the size I use. Do not get anything smaller in diameter (higher the number than smaller the thickness) because it’ll be too think to work with. I haven’t seen them sell a 14-gauge in this brand but that would do too. 12-gauge will be thick and too “hard” to bend especially if it’s not aluminum. 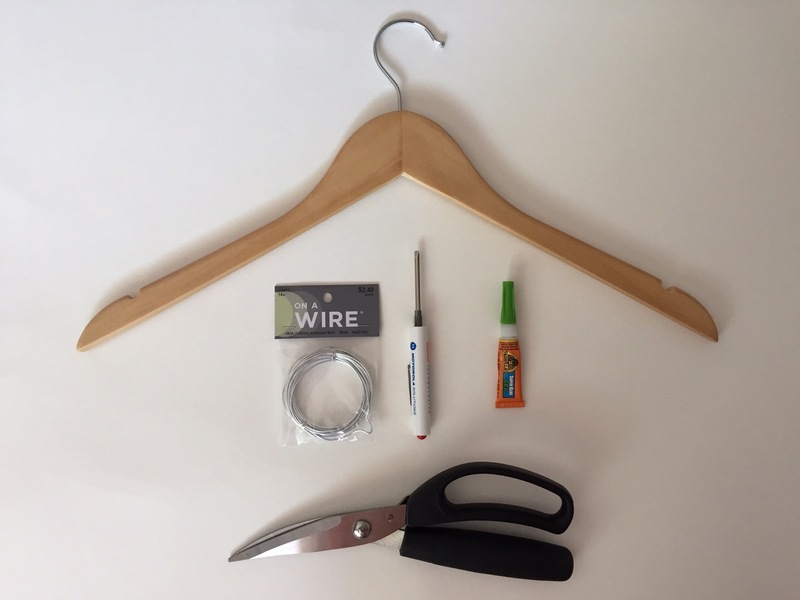 DO NOT BUY THE BULK-SIZE WIRE BUNDLE AT LOWE’S. IT IS TOO TOUGH AND YOU WILL NOT BE ABLE TO BEND IT WITHOUT HURTING YOURSELF AND YOUR PRIDE! 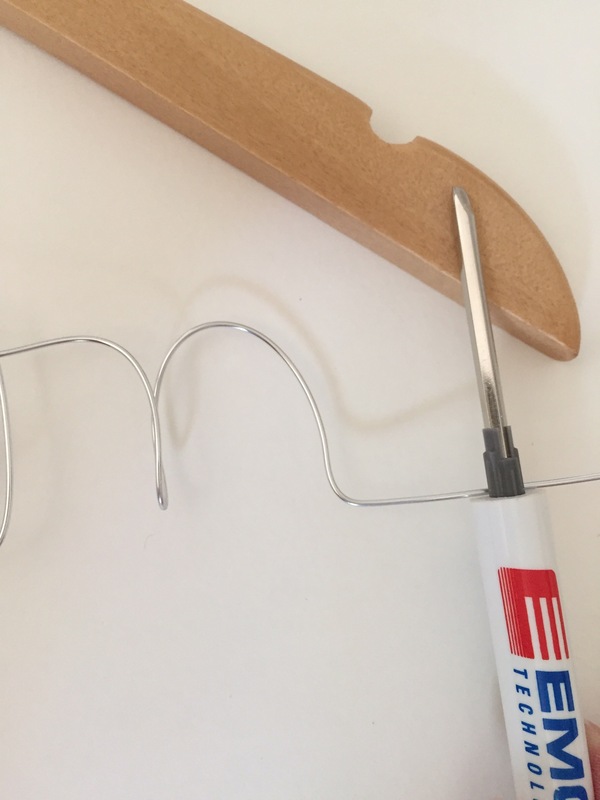 Super glue- I use Gorilla with the small narrow tip. Do not use hot glue because it’ll easily fall apart. First step is to sketch out the name without picking-up your pencil or pen. 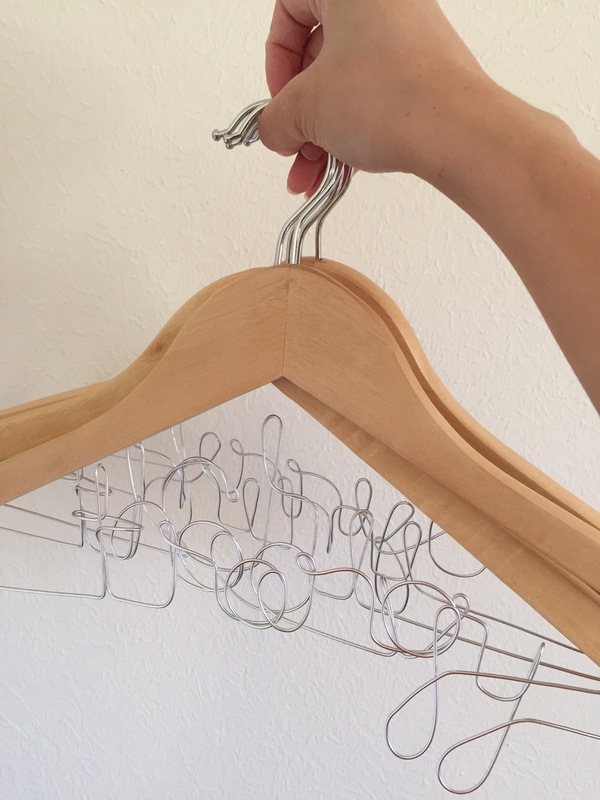 This is simply because you’ll use one continuous wire for the entire name you want on the hanger. It’s okay if you “overlap”-there’s a trick for that, but try to overlap as little as possible. Check the wire in the package before you buy it. 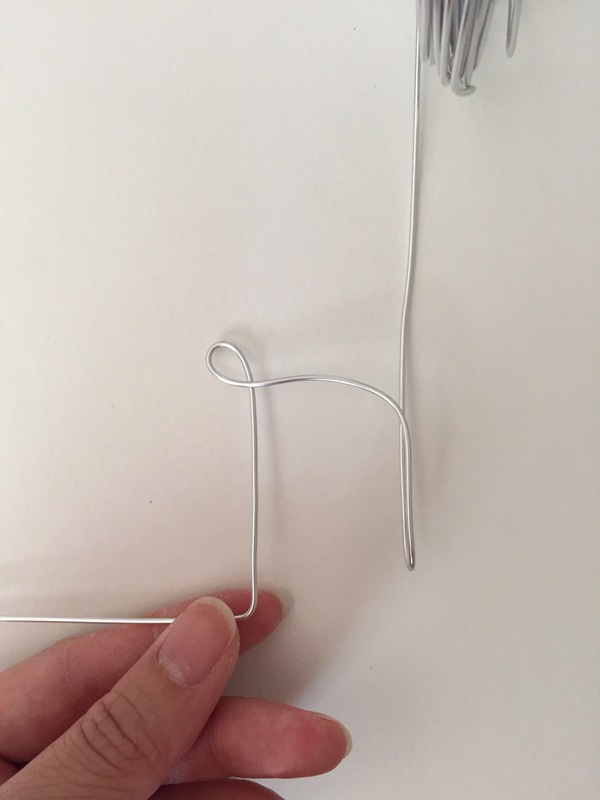 I bought one with this “curvy knot” and had to cut it off before starting on my name. Keeping the wire straight is essential to making it look good and this knot would’ve been hard to straighten out. Roll out about 4 inches and straighten. 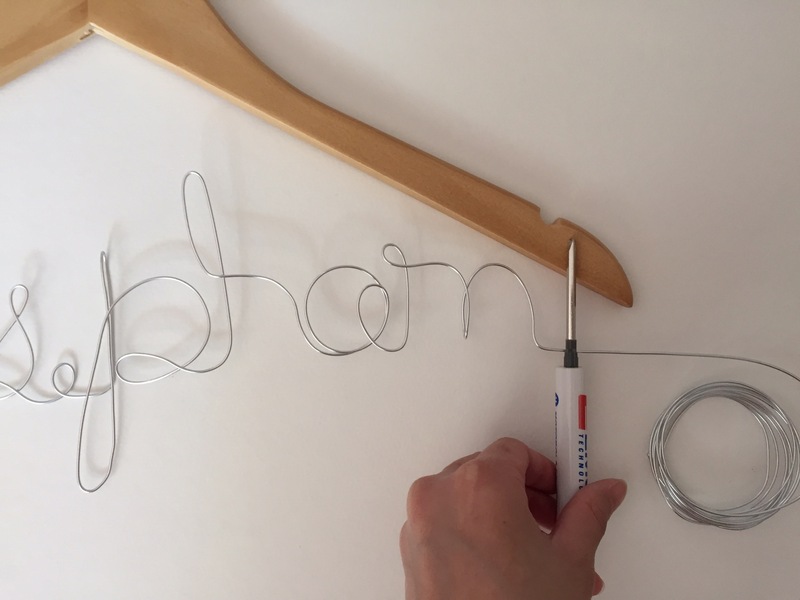 Constantly straighten the wire as you bend it to form your name. It’ll keep everything in alignment as you go and you won’t have too much for fix at the end. 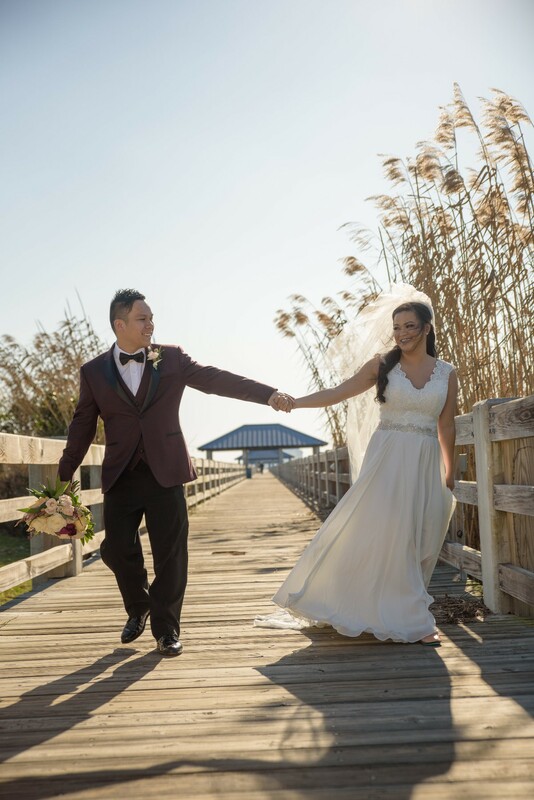 I’m spelling out “mrs. 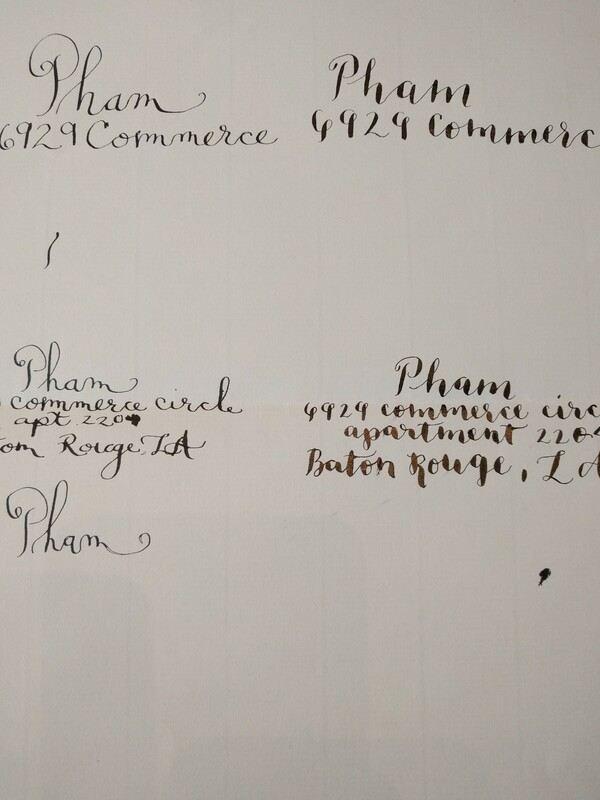 pham”. I like using lowercase letters. 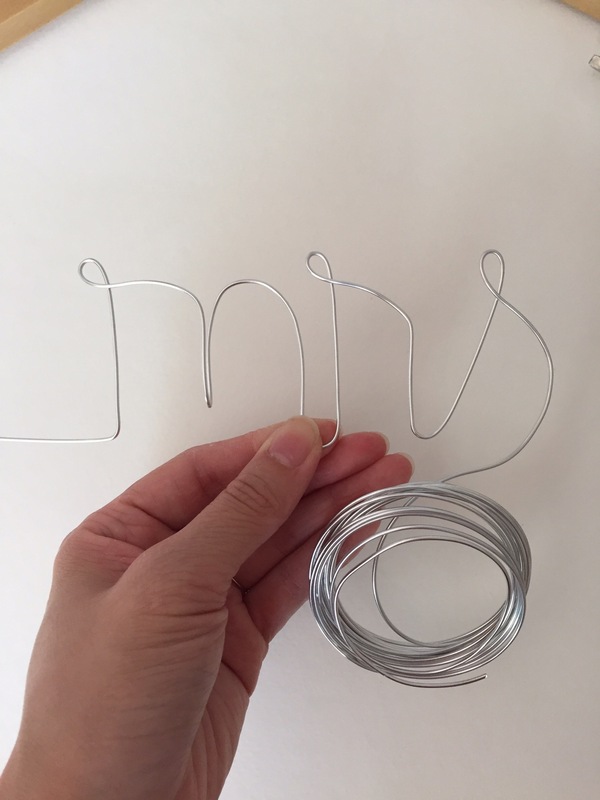 An easy way to figure out how to bend your letters is to google “bridal hangers” and it’ll show you tons of examples on every letter. It definitely helped me. Here’s the “overlap trick”. If you need to retrace a line then just “turn” the wire so that the “second wire line” is behind the “first wire line”. As shown below. 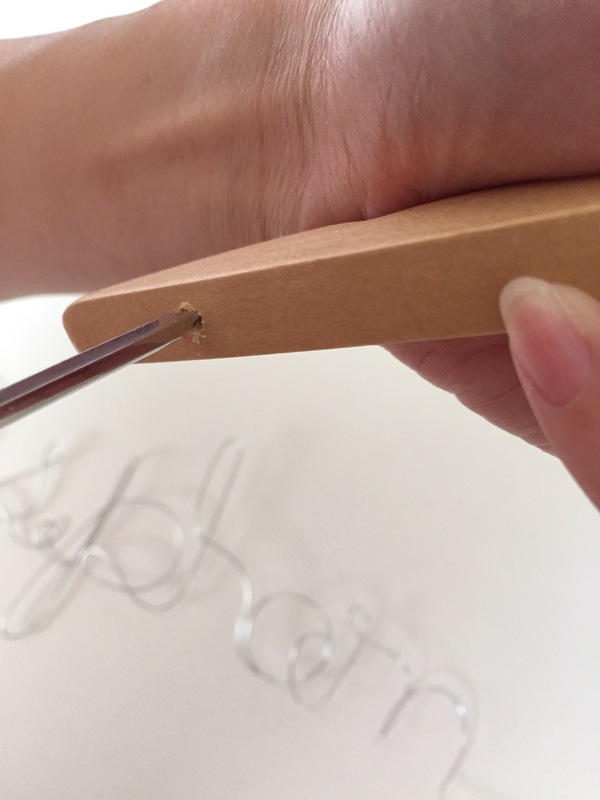 I like to pull more wire out little by little because sometimes you’ll need the wire to curve for a letter like this “s” below and leaving the wire bundled up will make it look more natural when you roll it out. You really just need to play around with the wire in your hands. I could see the entire name curved up and wasn’t straight. . . So I held both ends with either hands and gently pulled downward to straighten it out. See the difference? 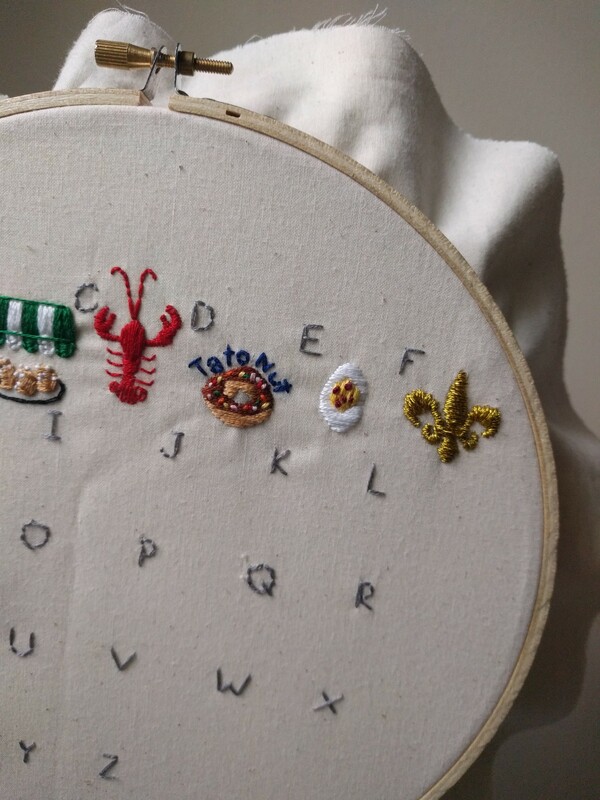 Next, I marked where I would’ve like the “holes” to be. You want the holes to be even with each other. I tend to like it on the outside of the slot for straps. It depends on you. 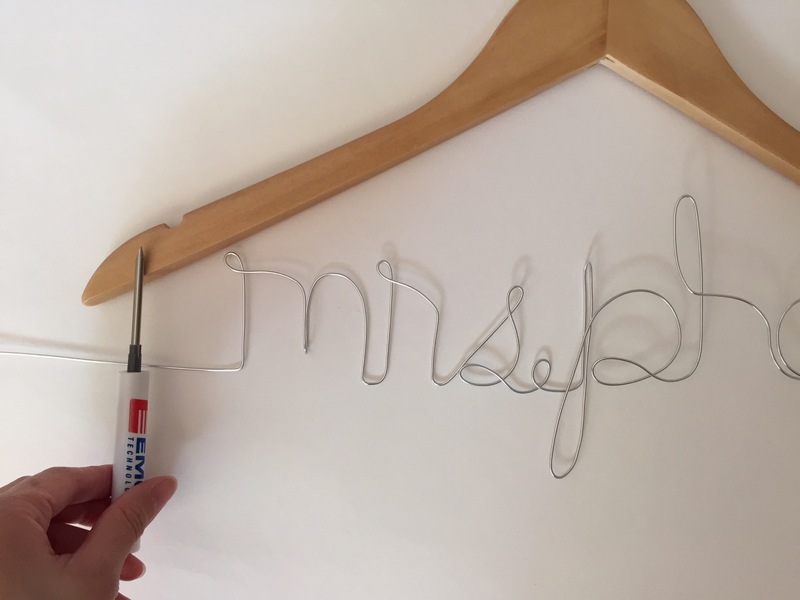 Notice how high the “m” is because you don’t want the letters to be placed on top or above the hanger AND you don’t want to cut the wire too short that it doesn’t reach into the “hole” you’re about to make. Check both sides and make sure it’s centered in the middle. 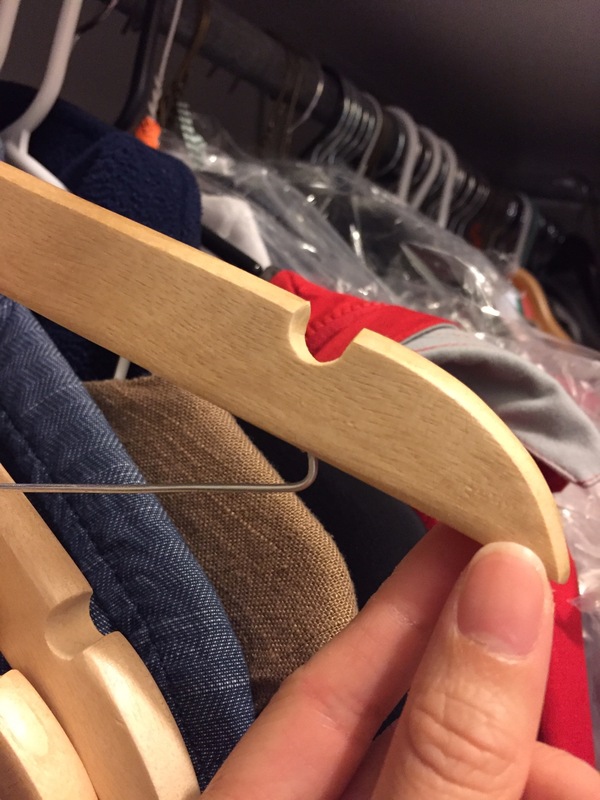 Once you mark it then screw a hole into the hanger on only ONE SIDE. Bend the wire where needed and. . .
. . .place into hole. With one side placed in the hole, check the other side and mark where you’d like the second hole to be. . . make adjustments as needed. Once you’ve placed both ends into their respective holes. Check again for adjustments. If you like it then you can finally “trim” the wire. This is how my final product looked like. 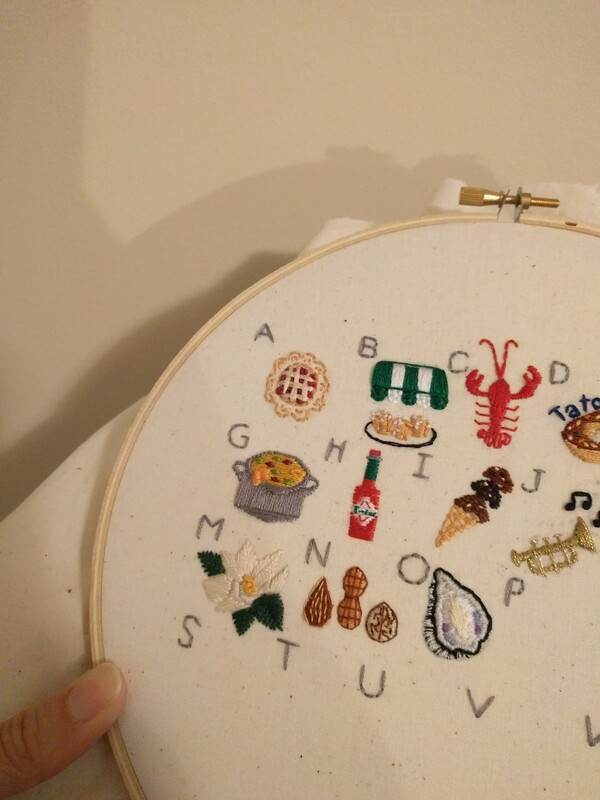 Honestly, I made the letters too big for my liking. 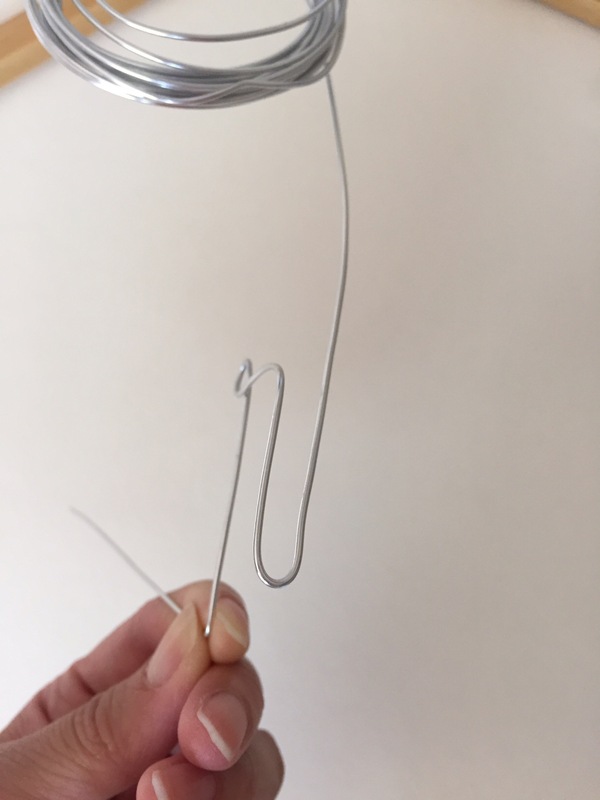 I aim to have both ends of the wire as short as possible. Here’s an example of what I’m talking about above^. See how short the end is? That’s how I like it. 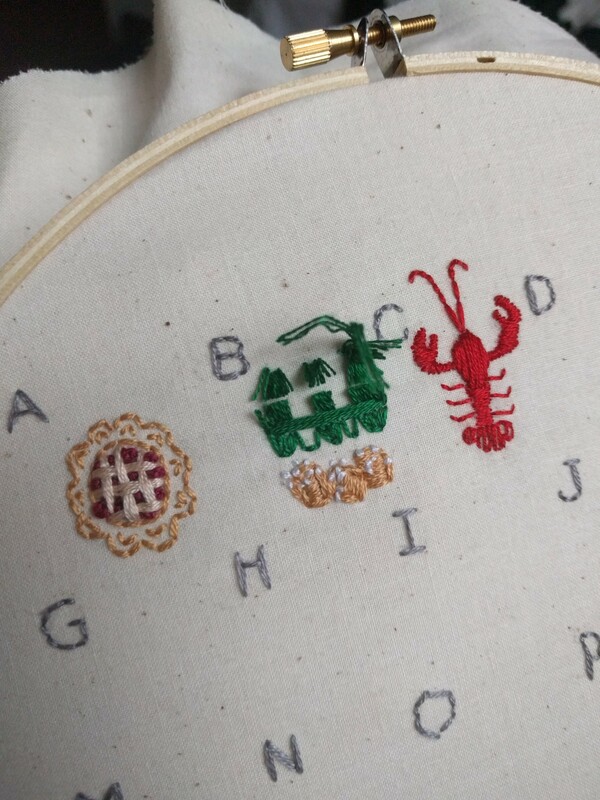 Sorry, I can’t show you the full hanger because it’s a gift from the bride to one of her bridesmaid. And the bridesmaid might be reading this! 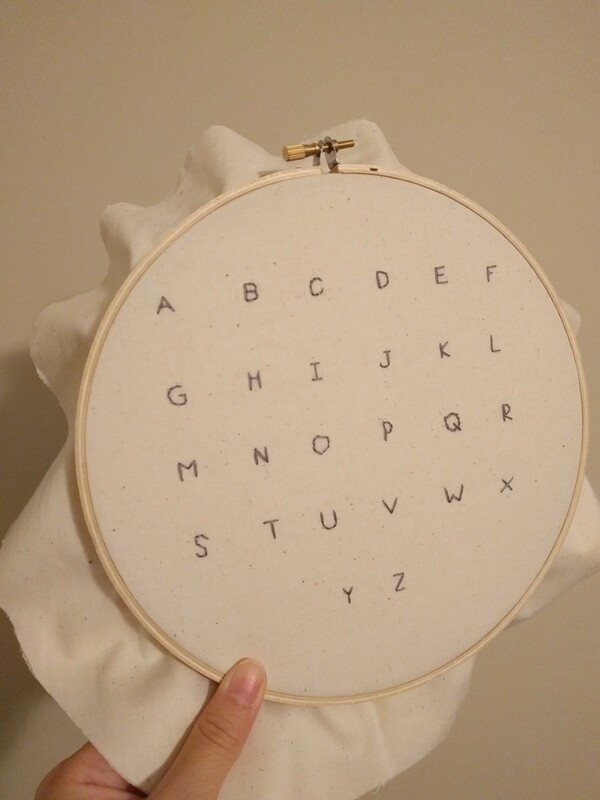 This tutorial is pretty tricky but don’t let that discourage you. 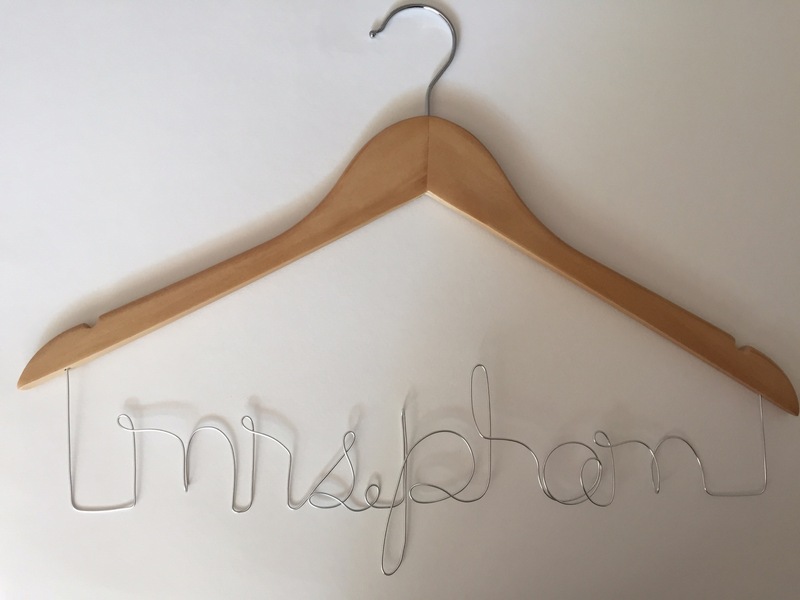 I messed up on so many hangers already like the “mrs.pham” I just did! If you buy the On The Wire pack I mentioned above then it should be enough for 2 names depending on how long the name is. Please feel free to ask questions! 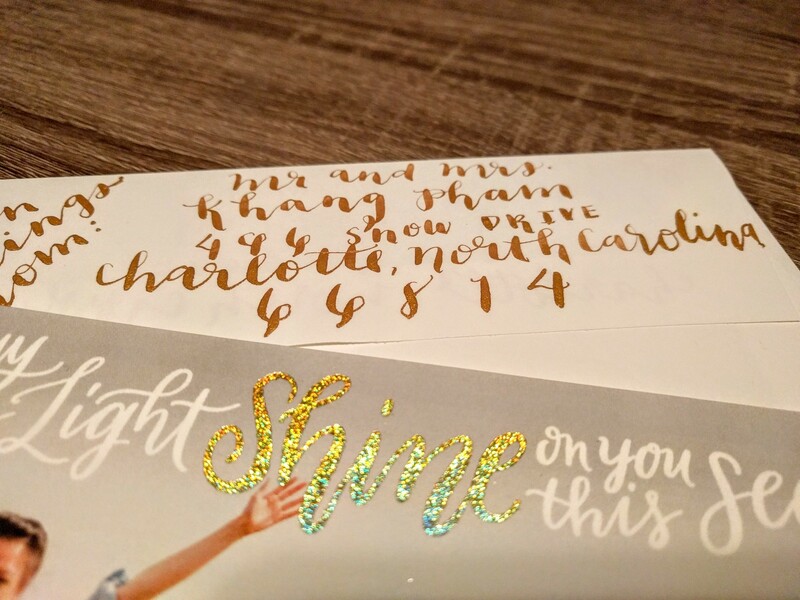 My cousin Thao-Vy asked me the other day if I had any advice to take her lettering to the “next level” after reading my previous blog about getting started with hand-lettering calligraphy. So that had me wondering if other people had the same questions as well. You can thank Vy for today’s blog. My family and friends commented the most on this tutorial 🙂 They either told me they wanted to try it or they actually did try it out! For those that did (you know who you are) THANK YOU THANK YOU FOR MAKING MY DAY! So back to Vy, I told her to not be afraid to be dramatic with the thicker lines. If there is a drastic contrast between thin and thick lines, then it’ll look better, at least in my opinion. Vy’s second question: Once I’m comfortable with pencils, what should I use next to practice? 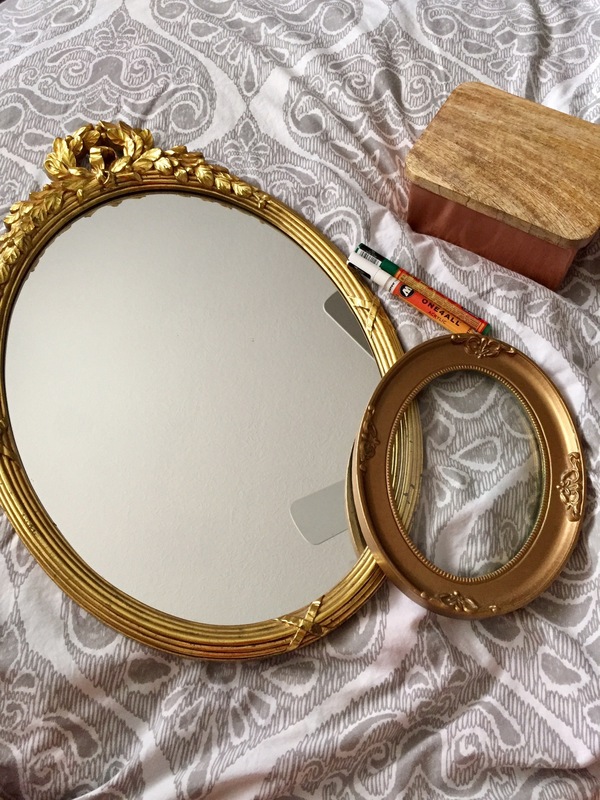 Because of practical reasons, I recommend practicing on your mirror at home or an old picture frame. The glass is a different texture from paper and it’ll help develop your skills. 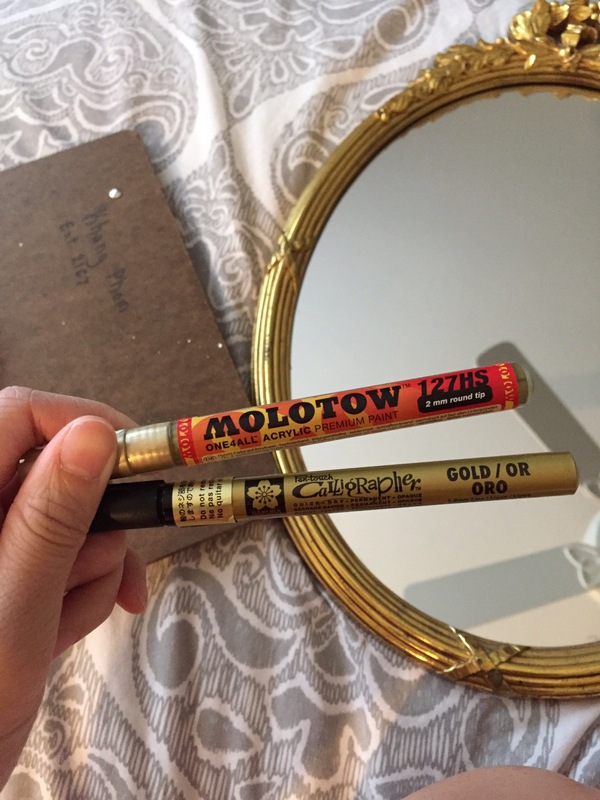 I like using water-wipe paint pens such as Motolow or Chalk Ink. They come in many colors and tip sizes, but I’ve only seen them online. I would start out with white and/or gold in a 2 mm tip or smaller. They’re super easy to work with and can be removed simply with water. If you’re impatient, like I was, and want to start now then I like lettering with Pen-Touch, which can be bought at Hobby Lobby. I like the 1.8 mm but the extra-fine tip is cool for detailed work too. 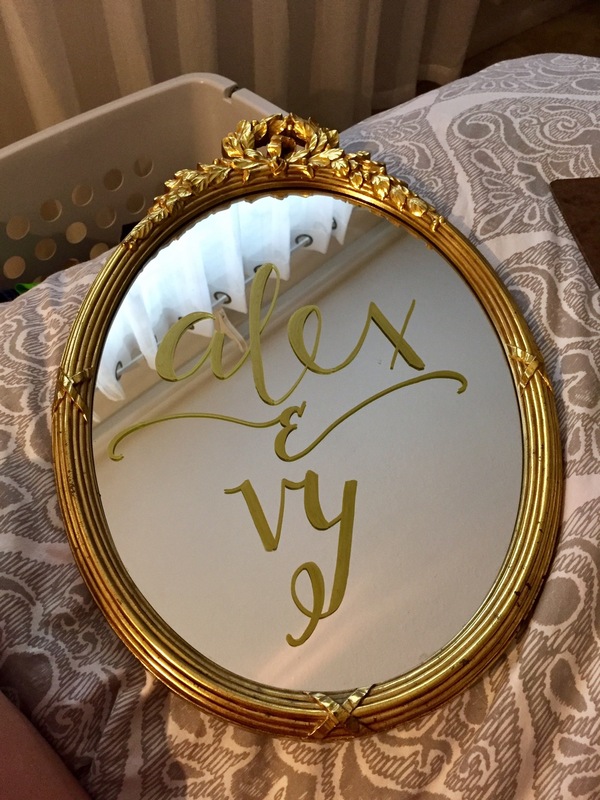 The downside to most paint pens at Hobby Lobby or Michael’s is that they are permanent/oil-based so you would need to buy something similar to Goof-Off to erase mistakes. FYI: Dipping water or goof-off with a Q-tip will help greatly when you need to fix a small error. 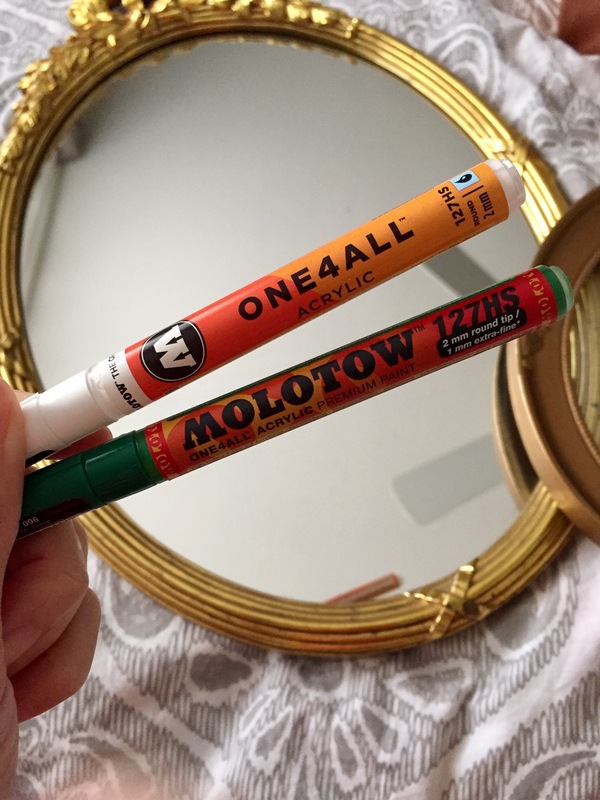 Here are some photos of me playing around on glass with Motolow and Chalk Ink pens. I didn’t feel like smelling the Goof-Off so I didn’t use the oil-base pens. 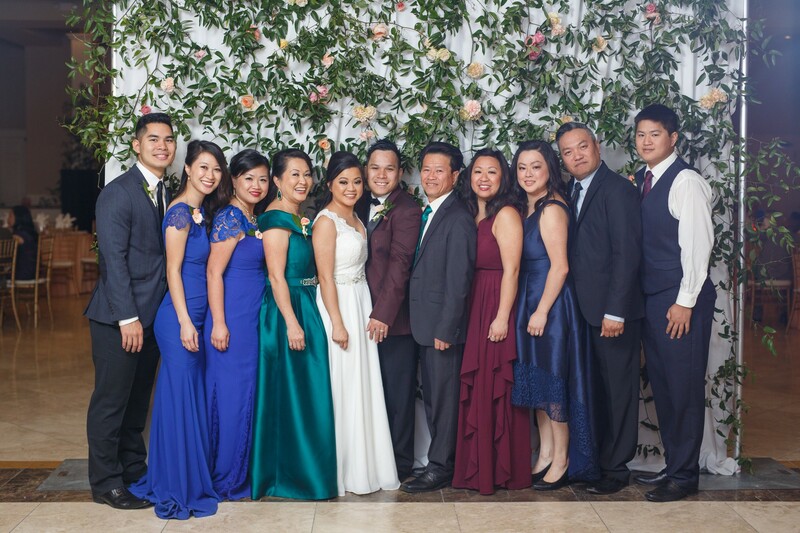 Shout-out to my sweet and always encouraging cousin Thao-Vy!!! 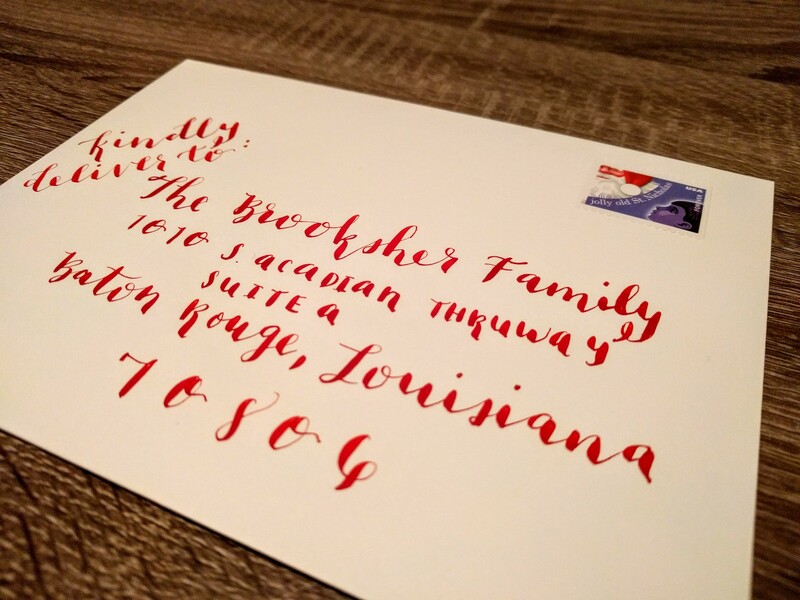 Of course the best advice I ever received from my sister Jill, who is a professional calligrapher, was practice, practice, and practice! 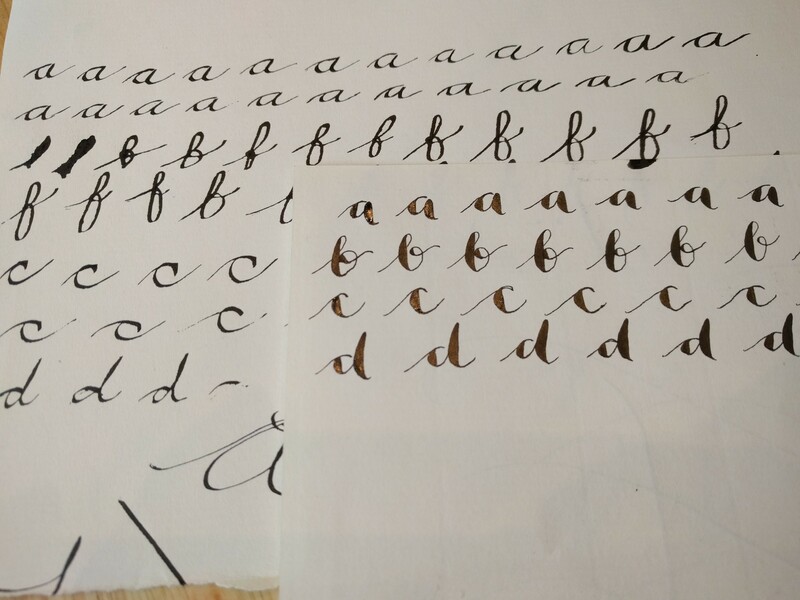 You’ll get more comfortable with your lettering the more you practice. Remember my cursive letters are just guidelines. 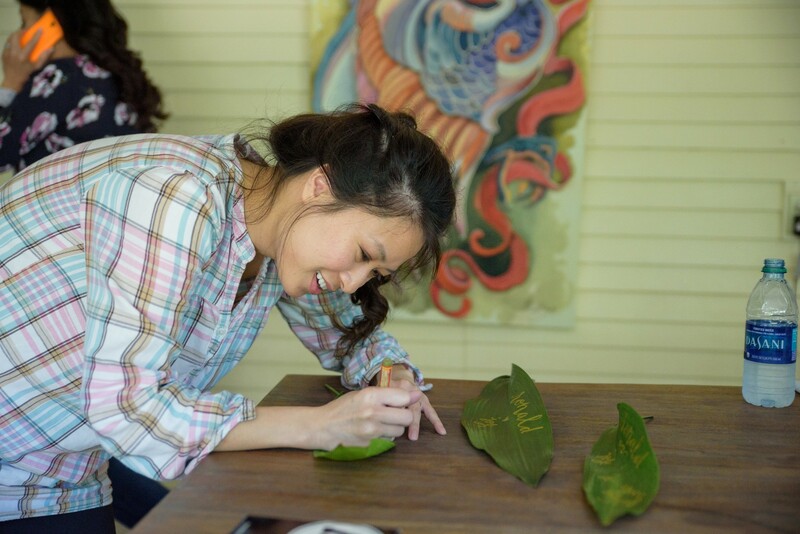 Discover your own calligraphy style and it’ll come naturally.